This page provides a top-level description of Small Transmitting Loop (STL) antennas (a.k.a. 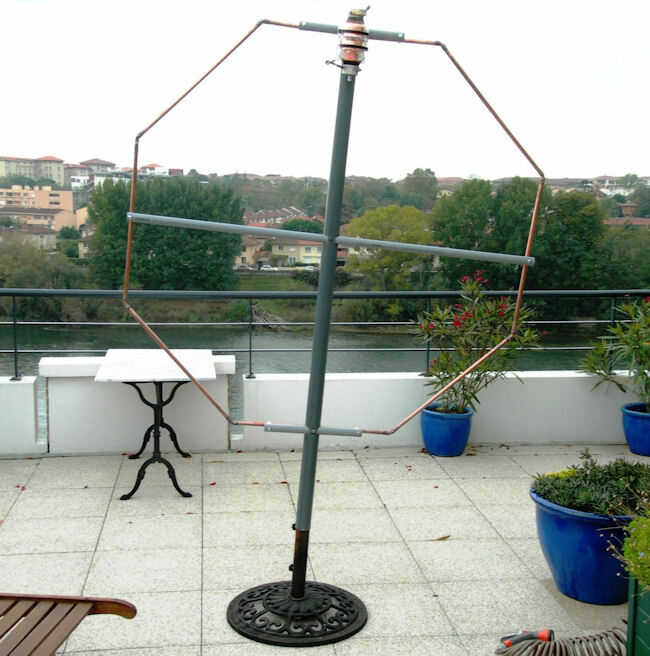 "Magnetic Loop Antenna", MLA), and my two versions of such an antenna for 80 mtrs and up. My smaller 40-20 loop is described here. My helically wound "Slinky" loop is described here. 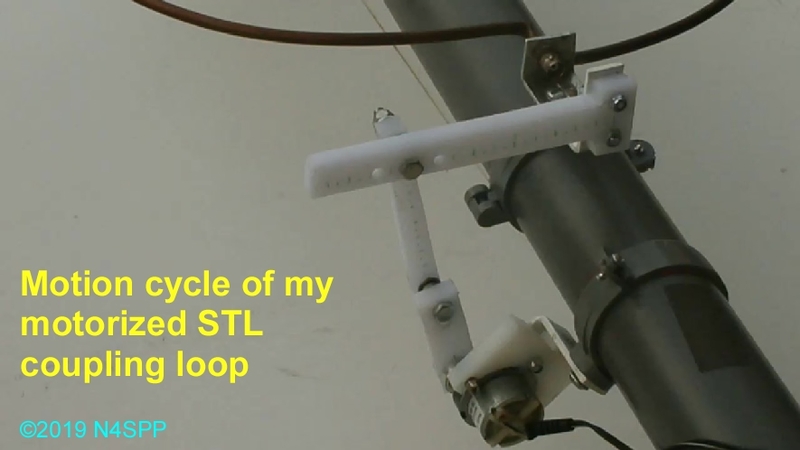 I wanted a small transmitting loop (STL) antenna that covers at least the 80 and 40 meter bands (preferable 80 - 20). Why? I want to do 80 mtrs DX, but I have no room for a decent 80 m wire-antenna, nor would I be able to install such an antenna high enough above ground. I have had some success with short, loaded vertical antennas with a single elevated radial, see here and here. But I cannot install those permanently at my QTH. Below 10 MHz, our apartment building generates a large amount of "electro-smog" QRM. 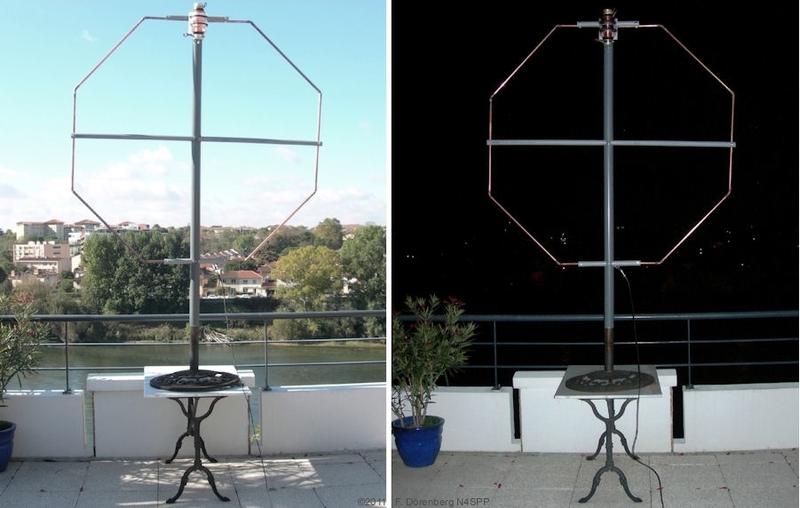 An STL tends to be less sensitive to picking up electrical noise in the near-field (< 1 λ), which appears to be the reason why this type of antenna is also referred to as a "magnetic loop antenna". STLs have a radiation pattern with directivity. They are also small enough to rotate with a small motor, or TV-antenna rotor. They are less conspicuous (to my friends of the home-owners association "police") than a wire antenna that is strung along the outside of the building. I don't want to have to mess with radials, counterpoises, RF-grounds, etc. Loops are inherently symmetrical, like dipoles. Can be installed close to the ground (vertically oriented), without significantly losing efficiency. Yes, higher is better. A loop antenna is generally considered "small", if its circumference is less than 10% of the operating wavelength. So in my case (for 80 mtrs), "small" would be a circumference of less than 8 mtrs, e.g., a circular loop with a diameter less than 2.5 mtrs (≈ 8.2 ft). To be more precise, we are talking about a small resonant loop. Note that a multi-band loop that is "small" in the lowest band, is not necessarily "small" in the higher bands ( = higher frequency). Clearly, as with all antennas, "radiation resistance" is very important parameter. As the graph below shows, the radiation resistance of an STL is very small - we are talking milliohms here! The radiated RF power is determined by the radiation resistance, multiplied by the square of the circulating RF loop current. As the radiation resistance is very small, a large loop current is required to get practical levels of radiated power. This implies that all losses (e.g., capacitor losses, contact resistance due to loop construction, losses due to coupling with the environment), even if only a couple of milliohms, are important in STLs! The radiation pattern of a Small Transmitting Loop antenna is shown below. The kidney-shape of the horizontal pattern (top view) becomes more pronounced ( = deeper minimums) as the antenna circumference becomes a larger fraction of the wavelength. This is the case when operating a multi-band STL on the higher band(s). For large loops, the maximums of the horizontal pattern are actually in the directions perpendicular to the surface of the loop! 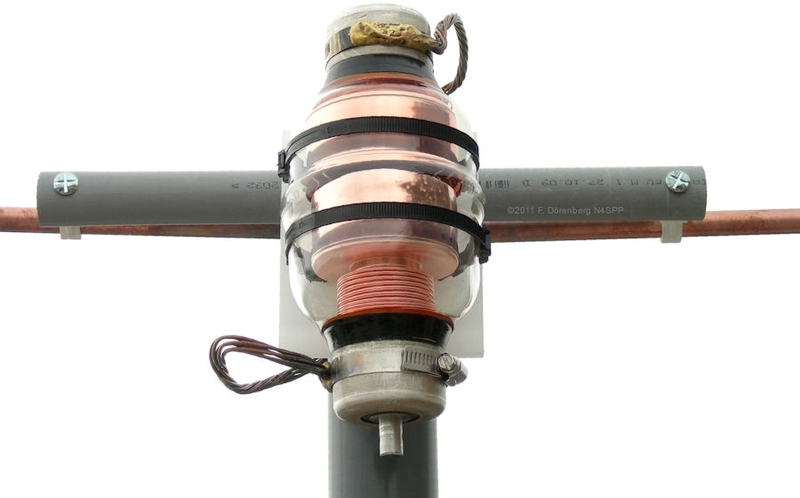 Due to the closed-loop shape, this type of antenna can be considered an extreme case of a "terminated folded dipole". A standard loop has a circular single-turn inductor. Of course, other shapes are possible: square, rectangular, octagonal, etc. There are variations such as multiple turns and configurations such as "figure-eight". As with dipoles, single-band directivity and gain can be increased by adding passive reflector and director loops, as in so-called multi-element "Yagi" beam antennas. This is all beyond the scope of this discussion. 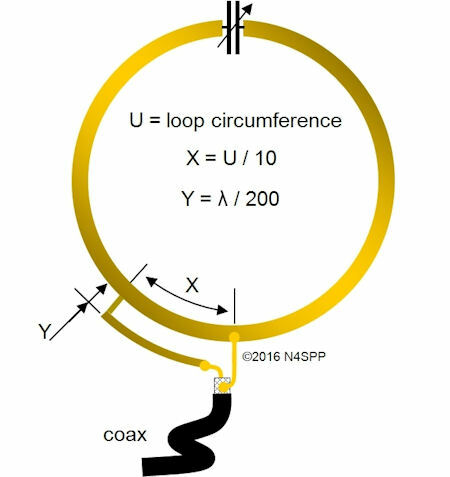 Just to get a feel for some basic parameters, I have calculated the characteristics for a circular loop with a circumference of 5 m (diameter =1.6 m, ≈ 5.2 ft), made of copper tubing with a standard 16 mm outside diameter (5/8"). Input power is 100 watt (the limit of my transmitter). If the input power is increased by a factor of N, then the maximum voltage across the capacitor is increased by a factor √N. E.g., doubling the power increases the capacitor voltage by ≈1.4. Conversely, the voltage is reduced by a factor of 1.4 when the input power is reduced by a factor 2. One important thing that the tables show, is the very high voltages across the capacitor at resonance. This is not only important when choosing a suitable capacitor, it is also a SAFETY issue! E.g., with 100 watt transmitter power, a small transmitting loop may generate an unsafe field strength up to a distance of ca. 4 meters (≈13 ft) at 14 MHz (20 m band) and 3 meters (≈10 ft) at 28 MHz (10 m band). As a rule of thumb, the optimum circumference of a multi-band STL is about 0.15 λ of the lowest operating frequency. With an appropriate variable capacitor, the resonance frequency of an STL can be tuned over a frequency range that covers at least two octaves ( = factor 4x). However, from an antenna efficiency point of view, a factor of 2-3 is probably the practical limit. E.g., 80-40, 40-20, 30-10. "Efficiency" is "power radiated by the antenna" divided by "power applied to the antenna". The tables above show that the calculated / predicted efficiency for 80 mtrs is rather low (no surprise), but my other antennas for 80 mtr are (very) short verticals. I do not know what their efficiency is, but I am sure that it is very low. In the end, what counts is performance at my location, for the available space, for the prevailing conditions (proximity to the building, QRM levels, etc), and with respect to other antennas that I can (afford to) install there. The efficiency of STL antennas remains controversial (ref. 3). I have not looked into the assumptions that the calculators make, regarding installation height (free space? ), coupling method, etc. As in all high-Q resonant circuits, calculated and actual performance is highly dependent on the losses in all components (loop, capacitor) and all interconnections. Losses in the milli-ohm range may be significant! In general, increasing the diameter of the tubing will reduce the (inductor) losses - up to a point. 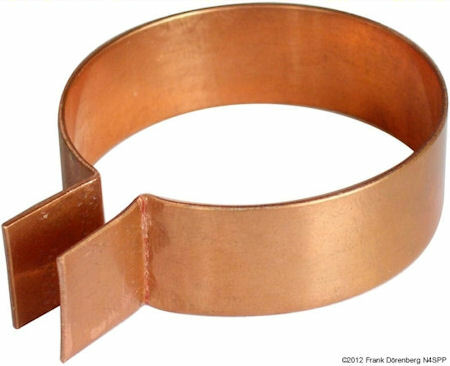 Instead of the standard tubular conductor, loops can be made of a wide, flat conductor strip such as copper "flashing" or foil. The strip can be straight (ref. 4), or helically wound (hence, helically loaded, ref. 5A/B). 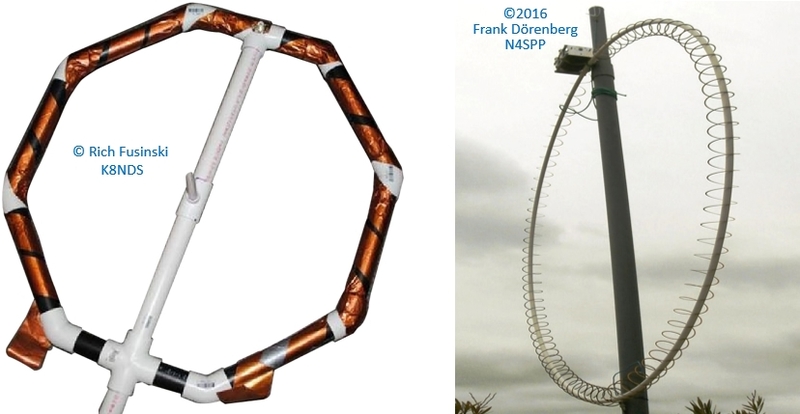 Of course, helical/spiral "hula hoop" antennas can also be made of a Slinky™ coil, as I did late 2016. Ref 5C, 5F. Another option is a meandering or fractal loop circumference. by adding "C" to the circuit. This is typically done by opening the loop, and connecting a variable capacitor across the open ends of the loop. 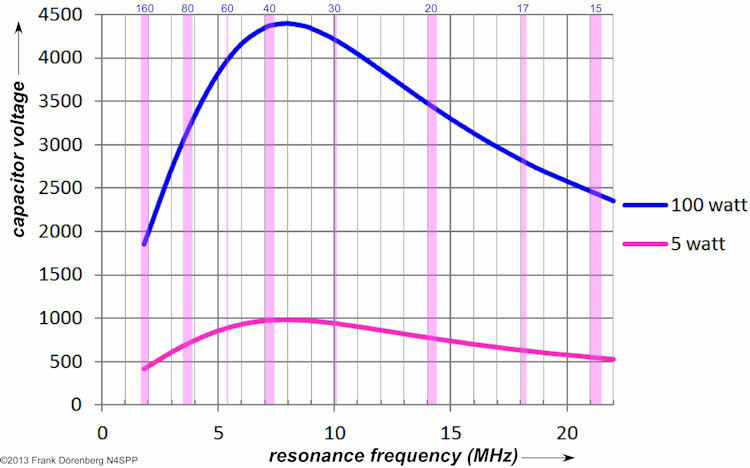 This is the standard way to "tune" the resonance frequency of a loop antenna. by adding "L" to the circuit. This can be done by opening the loop, and connecting a variable inductor across the open ends of the loop. Continuously variable inductors with a large value range, a high power rating, and low loss are rare. Also, a fixed-value capacitor may also have to be added to the loop, based on the value range of the inductor. This is why there are very few practical examples. The only example known to me, is described in ref. 13A. It uses a ferrite rod that is inserted into a 2-turn coil. This tuning method is not discussed in the rest of this article. The "L" of the loop can also be changed, by changing the size of the loop. However, this is not very a practical method for tuing the resonance frequency - other than for a single-frequency application. Note that when "L" or "C" is increased, the loop's resonance frequency is always reduced. Also, the loop not only has inductance, but also stray ( = parasitic) capacitance. This means that the loop has a self-resonance frequency, even without a tuning capacitor. 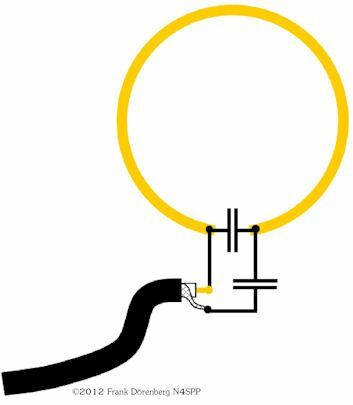 A simplified lumped-element diagram of a tunable LC-loop is shown below. The tuning capacitor is modeled as "non ideal", with equivalent series resistance (ESR) and inductance (ESL). Likewise, the loop's self-inductance includes loss resistance that represents skin-effect losses, construction losses (e.g., solder joints), etc. A "single-turn coil" loop is assumed, so no turn-to-turn stray capacitance is modeled. The model does contain parasitic capacitance, to represent coupling to ground below the antenna and to nearby objects. The "radiation resistance" is a fictitious conceptual resistance that relates the power that is radiated by the antenna, to the current flowing in the antenna. So it is directly related to antenna efficiency. It can be modeled, but unfortunately, it cannot be measured directly. "Tuning" the antenna is done by keying the transmitter (at low power setting) and observing the SWR-meter (or antenna-current meter) while adjusting the tuning capacitor. Alternatively, by tuning for maximum receiver noise level: there should be a sharp increase in the noise level when the antenna becomes tuned to the desired operating frequency. An other important aspect to keep in mind, is the voltage and the current distribution along the loop - at resonance. As shown in the figure below, the voltage is highest at the capacitor, and zero at the point diametrically opposed (in a perfectly symmetrical loop + capacitor + capacitor connections + environment). In some coupling methods, the braid ( = shield) of the coax feedline is actually connected to that neutral point. The current is highest at the point opposite the capacitor, and lowest at the capacitor. See ref. 1 for an illustration. Note that the minimum current is not zero! Unlike the voltage distribution, the current distribution depends on the size of the loop (circumference), as a fraction of the wavelength. 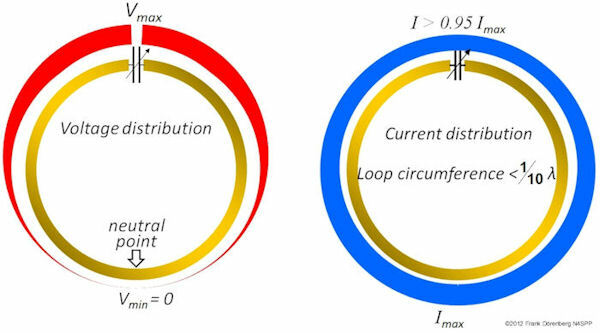 For a small transmitting loop (circumference < 0.1 λ), the current distribution is nearly constant (uniform) around the loop. Both the voltage and the current distribution are symmetrical. Based on the voltage and the current distributions, the impedance (Z = V / I) varies around the circumference of the loop. It is highest near the capacitor, and lowest at the point opposite the capacitor. E.g., there are two points, left and right of the neutral point opposite the capacitor, where the impedance is 50 ohm points with respect to that neutral point. This property is used in coupling methods such as Gamma Match and Delta Match. A loop with a fixed-value capacitor is resonant at a single, fixed frequency. 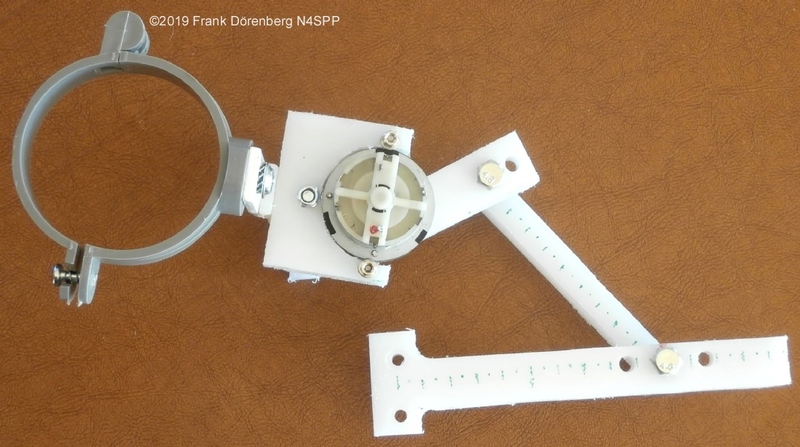 A well-constructed small loop antenna has a bandwidth that requires re-tuning when changing frequency across a band. Also, the resonance frequency will vary with temperature changes (sunshine/weather). In order to change the resonance frequency to the desired operating frequency, we need a variable capacitor. The basic choice is between "air variable" capacitor and "vacuum variable" capacitor. Clean air has a dielectric strength of 0.8 kV per mm (at 20 °C and standard humidity). So, an "air variable capacitor" for 5 kV would need an air gap of 6.25 mm (1/4 inch) between the plates. High-vacuum has a dielectric strength at least 10x as high. 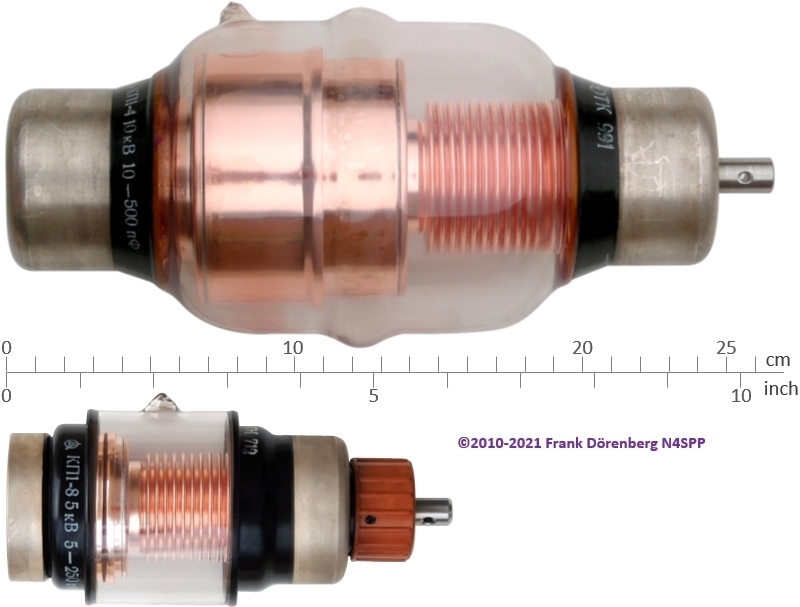 A typical air-variable capacitor is "rotary variable". It consists of a stack of stator plates ( = stationary), and a stack of plates that are mounted on a rotor shaft. The rotor plates intermesh with the stator plates. 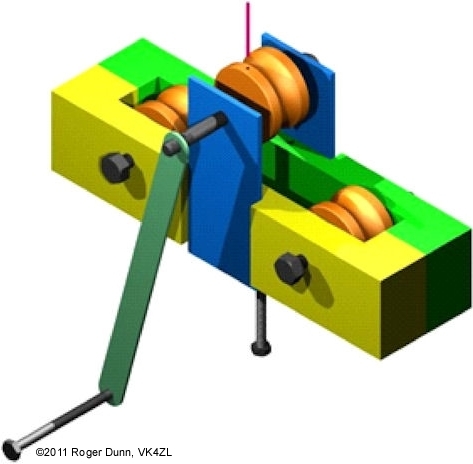 Ideally, the rotor plate "vanes" are welded to the rotor shaft (rather than clamped) to reduce loss resistance. Connection to the rotor is either done via a sliding contact, and via a bearing to the frame of the capacitor. This always causes losses (series resistance)! Such moving contacts also tend to make tuning a bit "jumpy", cause receiver noise when changing rotor position, and limit transmit power during rotor movement. Such capacitors are generally to be avoided in "high Q" STL antennas. A discussion of losses in air variable capacitors is given in ref. 12M. Single-section: a single rotor-stator section. Multi-section: basically two (or more) variable capacitors that are ganged (mounted side-by-side), with a single conductive rotor shaft. Hence, the rotor vanes of all capacitor sections are electrically connected. The losses of the wiper contact can be eliminated by putting two capacitor sections in series: the rotor contact is not used, only the two stator contacts. This doubles the voltage rating, but at the same time halves the capacitance. Broadcast-band: typically used in early AM/FM receivers. The rotational range (rotor "swing") is limited, typically to around 140°. This mechanical limitation makes motorized tuning more complicated. Plate distance is small, so only suitable for low power (QRP) transmission. As the plates and spacing are small, the sections are separated by a shielding wall. Split-stator: a 2-section arrangement in which the two sets of rotor plates are mounted on opposite sides of the rotor shaft. Likewise for the two sets of stator plates. "Butterfly". The rotor vanes are typically shaped like a bow-tie ("butterfly wings"). There are two rotor/stator stacks. However, they not arranged side-by-side, but diametrically opposite of each other. Note that the full capacitance range is covered by 90° turn of the shaft. There is not always a rotor contact. The RF current passes through the two "wings" of each rotor plate, rather than through the rotor shaft. This reduces losses compared to split-stator and a regular 2-section capacitors. The dielectric constant of oil is about twice that of air. So an air-variable capacitor may be immersed in oil to double its capacitance. It also doubles the voltage rating. Use an oil-tight non-metal container, and pure mineral oil (a.k.a. paraffin oil), synthetic motor oil, or similar. I.e., not transformer oil, which is expensive and typically very toxic. Make sure that the capacitor plates are completely immersed! Rather than meshing stacks of rotor and stator plates, a variable capacitor can also consist of "trombone-style" coaxial tubes: one tube is slid in and out of a slightly larger "stator" tube. This principle is also used in variable vacuum capacitors, see below. On 15 June 1896, Nicola Tesla filed US Patent Nr. 567,818A (awarded three months later) for an “Electrical condenser”, with increased efficiency that is obtained by “practically complete exclusion of air or gas from the dielectric”. I.e., the vacuum capacitor! Nowadays, such capacitors typically use two sets of plates that are concentric thin-wall cylinders. 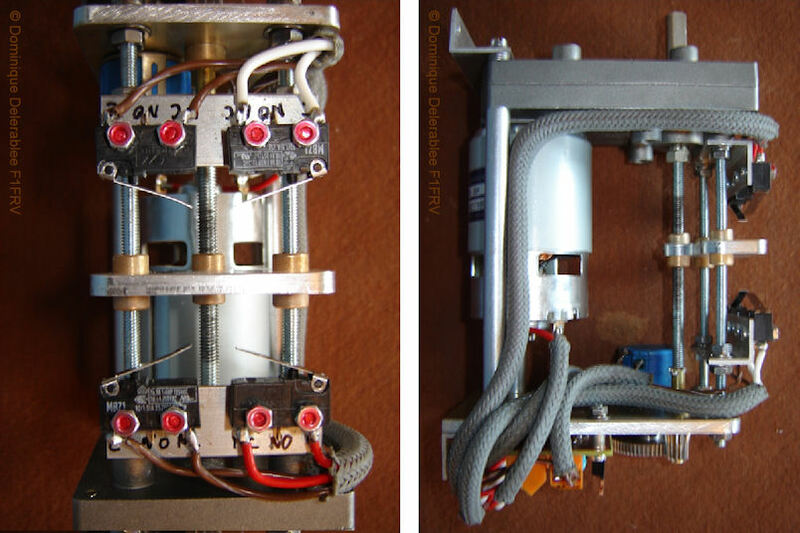 In a vacuum variable capacitor, one of the two sets can be slid in or out of the opposing set of cylinders ("sleeve and plunger/piston"). The same concept is used in old fashioned trimmer-capacitors that were made by Philips for several decades since the 1930s. Instead of intermeshing concentric cups, the electrodes may also consist of a continuous spiral (with a fixed pitch). In the vacuum capacitor, spacing between opposing cylinders is several mm. The plates are sealed inside of a non-conductive envelope such as a glass or ceramic "bottle", and placed under a high vacuum. 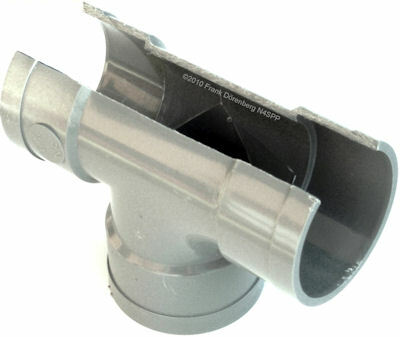 The movable part (plunger) is mounted on top of a flexible metal membrane (harmonica-style bellows). The membrane seals and maintains the vacuum. A screw-shaft is attached to the plunger. When the shaft is turned, the plunger moves in or out of the sleeve, and the value of the capacitor changes. The vacuum dielectric significantly increases the voltage rating of the capacitor, compared to an air-variable capacitor of the same dimensions and construction. The tables in the previous section show that the assumed loop should be tunable from 80-20 mtrs with a 15-500 pF high-voltage variable capacitor. Note: a commercial air-variable capacitor for 15-500 pF and 5-10 kV is not necessarily smaller or less expensive than an equivalent vacuum variable capacitor! In 2010, I purchased a Russian-made capacitor. It is marked "10 kB 10-500 πФ" in other words: "10 kV,10-500 pF". I measured 15-510 pF with a simple LCR-meter. This "bottle" is quite heavy: 2.2 kg (≈ 4.8 lbs). It takes 36 revs of the shaft to go from minimum to maximum capacitance. Have you ever noticed that the resonance frequency of your “Mag Loop” STL drifts when the capacitor’s temperature changes? The temperature change may be due to loss-dissipation in the capacitor when transmitting, the sun shining on the capacitor, or change in ambient temperature. Likewise, have you noticed a frequency drift when the relative humidity of the air changes significantly (foggy weather, temperature near the dew point)? Or you have noticed a change in the maximum transmit power you can apply, before a luminous corona discharge appears at the capacitor plates, or arcing occurs? These formulas ignore edge effects, and suggests that the capacitance C is a constant. However, the capacitance does change with temperature, as well as humidity and barometric pressure (air capacitors). Ref. 12B, 12C. TEMPERATURE. The capacitance of a decent “glass bottle” vacuum variable capacitor typically varies no more than about 100 ppm/°C = 0.01%/°C (ref. 12G). Ceramic vacuum capacitors only drift about half as much, but an air capacitor may drift three times as much. That’s still not much, right? Well, in a “low-Q” filter application this may well be the case. But in a well-constructed “high-Q” loop? Let’s take a marginal vacuum variable capacitor and assume a temperature increase of only 10 °C ( = 18 °F). Worst-case (! ), the capacitance will change by 10 x 0.01% = +0.1%. What does this mean for the resonance frequency of a loop antenna? I.e., a change of -0.5%: temperature increase causes a frequency decrease. For instance, at 28 MHz , the resulting frequency drift would be 28 MHz x -0.005 = -14 kHz. At 3.6 MHz, the resulting frequency drift would be 3.6 MHz x -0.005 = -1.8 kHz. This much drift is quite noticeable! Note that there are even small hysteresis effects associated with large temperature changes (ref. 12C). A standard "Mag Loop" STL antenna is a 1-turn air-core inductor. Like a capacitor's relative permittivity, a coil's relative permeability depends on the operating frequency, and the temperature, pressure, and humidity of the dielectric ( = "air" for a loop antenna)! ESR consists of metallic losses in the capacitor's electrodes and connecting leads, as well as dielectric losses. In a vacuum capacitor, the dielectric is "vacuum". Hence, the dielectric loss is negligible. At HF frequencies, the ESR of vacuum capacitors varies over a range of about 2 milliohms (at low HF frequencies) to about 20 milliohms (high HF). Ref.12G. The loss-resistance is primarily caused by the capacitor plates, the bellows and the structure that connects the movable electrode to its external mounting flange (in variable vacuum capacitors), and the transition between the rotor shaft and the rotor terminal (in air variable capacitor types, other than "butterfly" and "split-stator" with the stators interconnected). ESR is inversely related to the capacitor’s (frequency dependent) Q. Manufacturers of vacuum capacitors typically provide a nomogram chart of max allowable IRMS as a function of operating frequency at the specified peak operating voltage and max capacitance ( = largest ESR). Ref. 12B shows the example of a particular vacuum capacitor with a temperature rise of about 40°C when operated at 6 MHz, 7.5 kV peak, and 10 amps RMS. Glass vacuum capacitors typ. have a max operating temperature around 90 °C ( = 195 °F). Ceramic vacuum capacitors typically have a higher maximum: around 120°C ( = 250°F). Note that near resonance, a small transmitting loop may have a circulating RF current of several dozen Amps when transmitting at 100 W.
Dielectric absorption is the effect by which a capacitor that has been charged for a long time, does not discharge completely when briefly discharged. In air capacitors and vacuum capacitors, this effect is typically too small to be measurable. The insulation resistance Rparallel accounts for leakage current through the dielectric. For variable vacuum capacitors, the latter is typically less than 10 microamps. This is extremely small, compared to the capacitor current when the loop is tuned to resonance. The series self-inductance Lseries of an air variable capacitor typically ranges from about 6 to 50 nH. For fixed vacuum capacitors, it ranges from about 2 to 10 nH. Variable vacuum capacitors have a bellows and a structure to connect the movable electrode to its external mounting flange. This increases the self-inductance to about 6 - 20 nH, and this inductance changes with the capacitance. The capacitor's self-resonance frequency that results from this series inductance, is normally well above HF. HUMIDITY. Yes, the capacitance of vacuum capacitors is not affected by humidity: moisture can only affect the outside surface of such capacitors. But high ambient humidity may cause a small leakage current across the outside of the capacitor. However, for air capacitors, the capacitance change as a function of relative humidity of the air is actually so large, that such a capacitor can be used as a relative-humidity sensor (ref. 12D)! Note that air capacitors also exhibit small hysteresis effects associated with long exposure to high humidity (ref. 12F). Relative permittivity εr = 1 for vacuum. Dry air has an εr ≈ 1.0006 (at standard temperature and pressure of 1 atm). This “constant” changes 2 ppm/°C for dry air, and 7 ppm/°C for moist air. Ref. 12H. Dry air has a relative permittivity μr ≈ 1.000000037. I’m still trying to dig up data on the relative permittivity of air as a function of temperature, humidity, and partial vacuum. With my own helical loop antenna with air variable capacitor, I have observed a frequency drift of 0.5% (20 kHz around 3.6 MHz) when fog moved in, while temperature only changed 0.5 °C. BREAKDOWN VOLTAGE. Dielectric strength is the maximum voltage that can be applied across a dielectric, without electrical breakdown occurring. Simply put, at the breakdown field strength, the dielectric becomes (locally) conductive: sufficient electrons are knocked out of the dielectric and/or electrode material, are sufficiently accelerated, and free additional electrons via collisions. In capacitors with gaseous dielectric (such as air), the breakdown peak voltage as a function of plate spacing gas pressure is a non-linear relationship. It is modeled by Paschen's law and curves, and is critically affected by factors such as the geometry of the capacitor conductive parts, smoothness of edges, surface finish of the plates, ultraviolet illumination of the electrodes, etc. Breakdown results in a discharge, and can be limited to a luminous corona glow (low-current, high-voltage) around plate edges, or take the form of a "spark" (high-current, low-voltage). Dielectric strength of practical vacuum is not infinite. Even deep space is not a perfect absolute vacuum. Ref. 12K. In vacuum electronic components, the vacuum level is typically on the order of 10-7 Torricelli ≈ 0.0133 mPa. The breakdown field strength of air is often given as VS = 30 kV/cm = 3 kV/mm = 3 MV/m. Note that this only applies for electrode (plate) spacing of about 2 cm = 20 mm! For smaller spacings, it is actually larger! E.g., for a spacing D around 1 mm, the following Townsend’s formula is used in standard atmosphere: VS = (30xD + 1.35) kV, where D is spacing in cm. For 1 mm (D = 0.1 cm), this yields VS = 4.35 kV, i.e., ca. 43 kV/cm = 4.3 kV/mm = 4.3 MV/m. The breakdown field strength of air is actually on the order of 2-5 MV/m. Note: if a vacuum capacitor is kept in storage for a long time, or is only exposed to low peak voltage levels for a long time, some gas may be released into the vacuum. This reduces the breakdown voltage below the capacitor’s specified test voltage rating. The capacitor may have to be reconditioned (treated with an increasing DC voltage). Before I bought my used vacuum capacitor, did a quick test to verify integrity of the vacuum: I put the capacitor in the refrigerator for about an hour. There should be no formation of condensation on the inside of the glass when in the fridge, or after taking it back out (on outside is OK). If the vacuum seal is compromised, the shiny copper will turn dull eventually. As heavy as the capacitor is, the glass is actually rather thin. I found this out when my first vacuum capacitor imploded when it rolled around on the tiles of my terrace floor. Note: this is only a overview of the most common methods. The list is not exhaustive. The size of the coupling loop. Its standard diameter is 1/5 that of the main loop. However, I have seen designs with 1/3 to 1/8 the diameter of the main loop. The shape of the loop. The standard shape is circular. Obviously, like the main loop, other shapes can be used (square, octagonal, ..). To obtain the desired coupling, the coupling loop can be squashed or stretched into a vertical oval or egg-shape. This changes the aperture of the loop (area of the "opening"), as well as the distance to the main loop. Placement along the main loop. Standard is opposite the tuning capacitor. However, to adjust the coupling, it can be moved off-center, along the main loop. Proximity to the main loop. Normally, the coupling loop is placed opposite the tuning capacitor, close to the main loop. Alignment with the main loop. That is: whether the plane of the coupling loop coincides with that of the main loop. The coupling with the main loop can be varied by turning the coupling loop about its vertical axis (from where the coax is connected to the point at the top of the loop), such that it sticks through the main loop. Instead of turning, it can also be bent. The gauge of the conductor - as with all coils / inductors. A distinction is made between "un-shielded" and "shielded" coupling loops. A heavy gauge wire or small diameter copper tubing; the conductor need not be heavier gauge than the center-conductor of the feed-line coax. However, heavier conductor will help retain shape of loop, and make it self-supporting. I have used "extra heavy" single-strand (solid) installation wire of 2.5 mm2, but these days I use soft copper tubing of about 6 mm diameter in my large loop (see Fig. 79 below), and thin brass tubing (see Fig. 9 of my small STL project). This is mechanically quite stable. With such a simple coupling loop, I obtain very good SWR over a frequency range of up to 2 decades (factor 4), see Fig. 79 & 80 further below. The shield of a section of coax cable. The center conductor is left unconnected, or both ends of it are connected to the shield. The center conductor of coax, with outer insulation and braid fully removed. The dielectric material of the coax is kept, and provides rigidity. 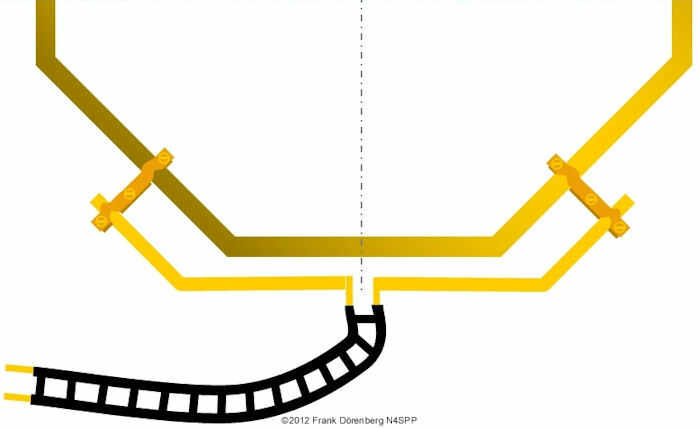 A variation of this method is what I call the "coat hanger" coupling loop. It consists of insulated wire (e.g., installation wire, or even heavy enameled copper wire). The overall wire length is a little more than the diameter of the main loop. The coupling loop is symmetrically placed onto (and affixed to) the main loop, over a distance equal to 1/2 the main loop's diameter (i.e., ≈ 1/6 the loop's circumference). Rather than connecting the coax at the bottom, it is connected at the top of the feed loop. I.e., an upside-down wire loop. 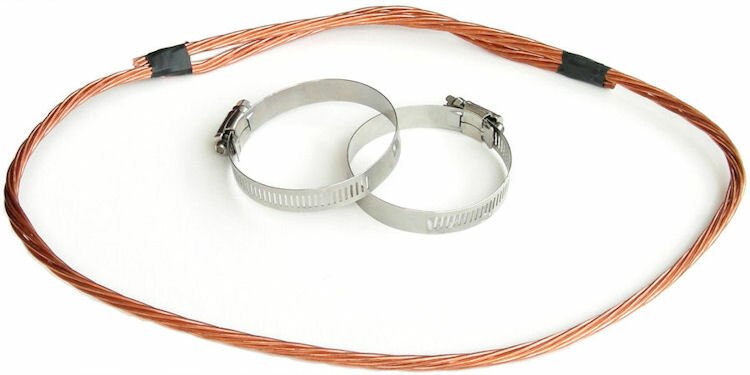 The wire ends are folded towards each other, joined and twisted over a distance of about 10-12 cm (4-5"; not critical), and connected to the coax. A current choke "balun" is placed near the coupling. The point where the wire ends are twisted, is moved up or down, to obtain the desired matching. I have only briefly played with this coupling method. The antenna's resonance frequency varied quite a bit when the twisted connection to the coax was moved up and down. SWR was relatively flat over a significant frequency range - about 200 kHz, quite a bit wider than with a regular coupling loop. This is similar to the triangular feed-loop of my (mono-band) spiral loop antennas, where the coupling loop has a circumference that is 1/8 that of the spirally-wound 1/4 λ main loop. 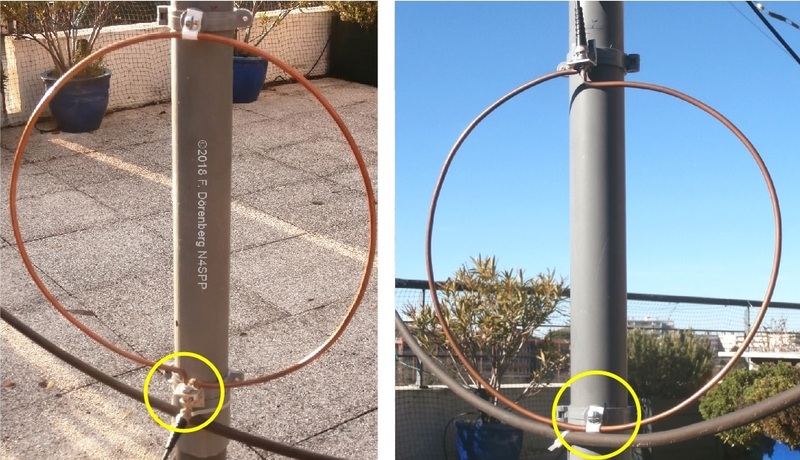 The coupling between the triangular coupling loop and the main loop can be made tighter, by winding the insulated wire of the coupling loop around the main loop, like Jo Lourenço (CT1ECW) has done for his 7-21 MHz loop (ref. 6M). This looks like a "twisted" delta-match. The same technique is used in the "twisted" gamma-match that is shown further below. The second type of inductive coupling loop is the shielded loop, often referred to as a "Faraday Loop". As with the unshielded coupling loop, the typical diameter is 1/5 that of the main loop (though some people have better results with a coupling loop as small as 1/8 the size of the main loop). 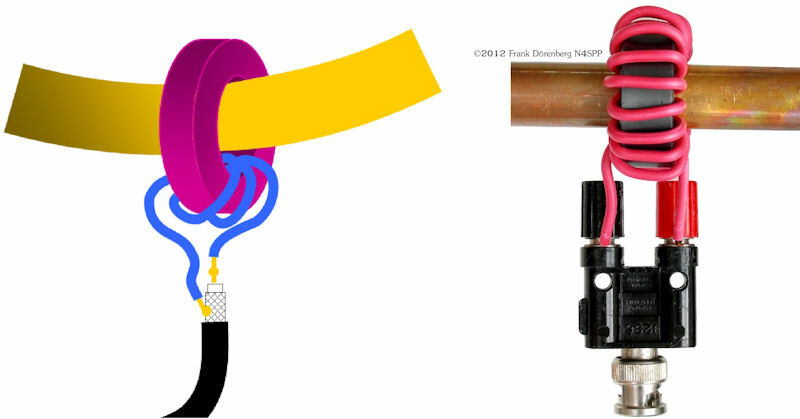 For ease of construction, this coupling loop is typically made of a section of coax cable. In my experience, it is difficult to make such a coax loop mechanically stable, especially with thin coax (RG58, RG8,...) and a "Faraday" configuration ( = interrupted coax braid and center conductor). how the braid and center conductor are connected at the starting point of the loop. 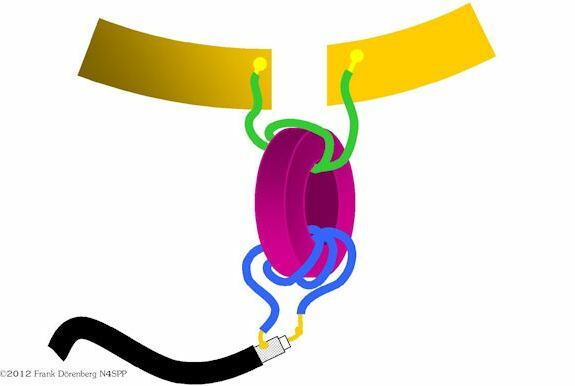 Let's have a closer look at variation D. The shield of the coax loop envelopes the flux that is created by the 1-turn coil formed by the center conductor of that coax. This induces a voltage across the looped shield. The maximum voltage occurs at the point where the shield ends. At the mid-point of the coax loop (i.e., at the top of that loop in the diagram), half of this maximum voltage is present. Hence, the loop as a whole, also has an average Vmax/2 with respect to ground. This coupling loop generates an electrical field that is primarily vertically polarized (assuming the coupling loop is installed vertically), This is coupled into the shield of the feedline. Conversely, this loop "receives" vertically polarized E-fields, incl. from the feedline (which may carry any disturbances that the transmitter passes to ground from its power supply and main power). This problem is solved in variation B. Here, the left-hand and right-hand half of the coupling loop generate opposite ( = cancelling) voltages. In the vertical direction, the average is now zero. This eliminates receiving and generation of vertically polarized E-fields. Clearly, there still is reception and generation of horizontally polarized E-fields. In principle, both polarizations can be suppressed by opening the coax loop at the 3 o'clock and the 9 o'clock position, instead of only at the 12 o'clock position. See variation F.
For the same diameter, the unshielded and the various shielded coupling loops all have a different self-resonance frequency (easily measured when not coupled to the main loop). SWR increased linearly with the distance between the coupling and main loop (from close to 1:1 to ca. 5:1). Lowest SWR was obtained with the coupling loop closest to the main loop. The shielded coupling loops had slightly better SWR than the unshielded coupling loop. Network parameter S11 is the magnitude of the Reflection Coefficient, expressed in dB. That is, S11 = +20 x log(abs(Γ)), where Γ is a complex number (a vector entity). It has a magnitude that is commonly denoted ρ, and a phase angle θ. S11 is 0 for a full reflection and negative for anything else. "Return-loss" is simply that same dB value of S11, but with the opposite sign (at least for passive devices such as antenna systems). "Return loss" does not mean loss due to reflection ( = "return"), but rather means loss of reflection. Jochen observed that S11 increased rapidly when the distance was increased from 0 to 2-3 cm (1"), then became more flat with further increase in distance. Over the initial distance increase, the shielded coupling loops had better coupling: S11 was more negative by about 6 dB ( = return-loss decreased by 6 dB). See the figure below. The main loop and the coupling loop basically form an air-core transformer. Some literature claims that the transformation ratio only depends on the ratio of the surface area of these two loops. As shown above, this is simply not true - unless the two loops are round, concentric, and co-planar ( = lie in the same plane), and the loop-current is uniform around the loop's circumference. Ref. 6Q. This rotation can actually be motorized with remote control (see this section further below), to maintain low SWR over a larger frequency range than is possible with a fixed-angle coupling loop. Assuming that the radiation pattern of the antenna is symmetrical, then the motor drive only has to be able to rotate the coupling loop about its vertical axis over 90° max, Actually, the required rotational range will be a lot less than 90°: when the two loops are close to perpendicular, the coupling will not be good. Note that asymmetrical coupling methods such as the Gamma Match make the radiation pattern somewhat asymmetrical. Objects close to the antenna may have the same effect. The capacitive coupling methods basically consist of one or two tuning capacitors, and one or two loading capacitors. This suggests that there are several configurations, as is indeed the case. This type of coupling is much "tighter" than with the coupling loops described above. This may make the antenna system more effective, even though the "Q" of the loop is reduced. Configuration B in the figure above is referred to as the "Patterson loop" (ref. 6B, 6P) or "Army loop". It was used in overseas adventures of the US army in the 1960s. The octagonal loop for 2-5 MHz consisted of 5 ft (1.5 m) sections of aluminium tubing (diameter: 1.75 ", 4.5 cm). The ends of the tubes were gold plated, to reduce contact resistance. A simple transformer coupling can be made, by passing the antenna loop through a ferrite ring (toroidal core). The secondary side of the transformer is then formed by one or more turns of insulated wire. 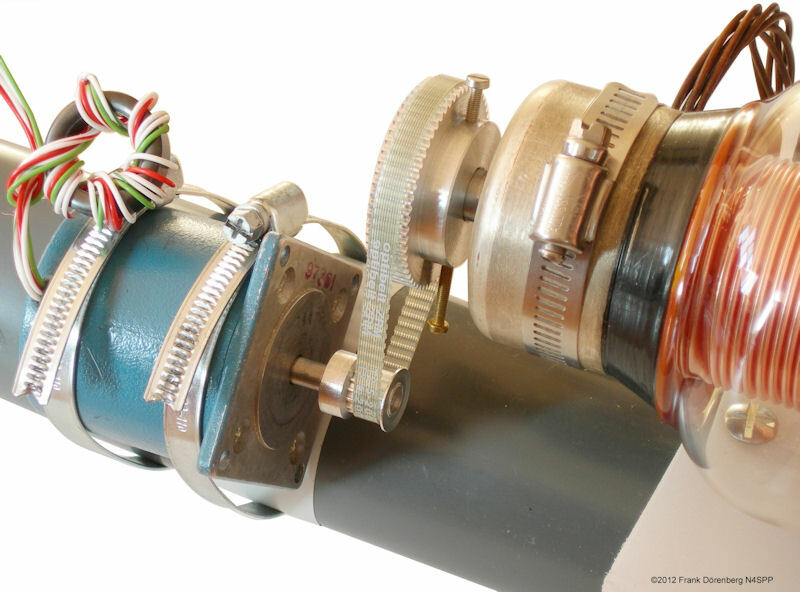 The coax cable is connected across the secondary winding. There are no adjustments or other manipulations required. The type of ferrite material. The size of the ferrite cores. The number of stacked cores. the number of secondary turns. Mix 43 becomes quite lossy above about 7 MHz. Use this material mix for 80-40 mtrs, possibly 80-30. Below 5 MHz, Mix 31 (a manganese-zinc mix) is probably a better choice than type 43 (nickel-zinc mix). To cover 20 mtrs and above, use material Mix 61 (nickel-zinc-iron mix). Note that properties of ferrite cores may vary as much as 30% from the nominal values in the data sheets! Also, there are not homogeneity specs for ferrite material, and hot-spots may occur at power levels below the maximum. Obviously, the ferrite core must be large enough for the ring to be slid over the loop tubing and accommodate the required number of secondary turns. More importantly, ferrite RF transformers must be operated at a core flux-density level that is commensurate with the volume and cross-sectional area of the ferrite ring. Conversely, the core dimensions should be adequate for the power level and frequency. The maximum allowed flux level is driven by the loss-tangent ( = dissipation hysteresis loss factor) of the ferrite mix. If that flux density limit is exceeded, then a runaway effect causes the core temperature to rise very quickly and ultimately (and possibly violently) destroy the core! Note that mix "61" has a Curie temperature (above which the ferrite properties are permanently destroyed) that is much higher than that of type "43": 350 °C (660 °F ) vs. 150 °C (300 °F). Two or more cores can be stacked to increase power handling capability. However, stacking cores also increases the total inductance of the transformer. Furthermore, a larger core also results in larger inductance, compared to a smaller core of the same material. 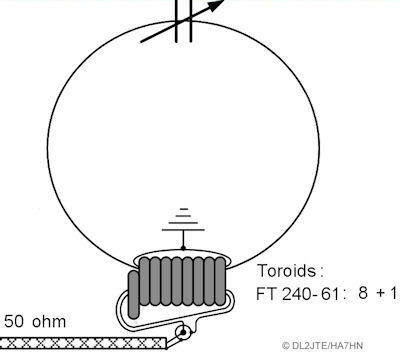 E.g., a T-240-43 toroid (2.4 inch outer diameter, material type 43) has a higher AL value ( inductance in μH per 1000 turns) than an FT-140-43 (1.4 inch OD): 1075 vs. 885. Experiment! Very small cores such as T-82 or T-130 are basically limited to QRP operation. As it is a 1:N transformer for voltage and current, N (the number of secondary turns) has to be chosen such that 50 / N2 = impedance of the loop at the point where the transformer is installed on the loop. N is typically determined empirically, by trial-and-error: start with a number that is too high, measure SWR at resonance, then reduce by one or two turns at a time. 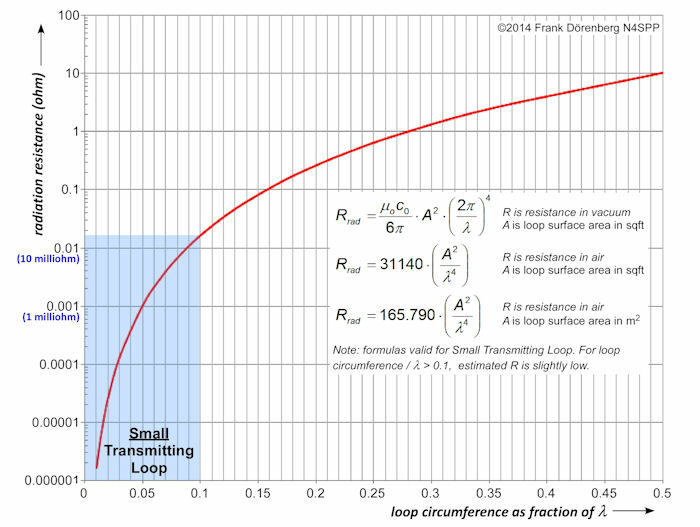 In a small transmitting loop, the current is basically constant around the loop circumference. This is illustrated in the introduction section at the top of this page. So it does not make much of a difference where the transformer is placed around the loop. However, if the loop size is increased to, say 0.2 - 0.25 λ, the loop is no longer "small", and the current through the capacitor is significantly smaller than the current at the point opposite the capacitor. This means that the coupling with a ferrite core transformer then does depend on where the transformer is placed along the loop. The turns of the secondary winding should be spread out evenly around the ferrite ring, to minimize parasitic capacitance. Lásló Rusvai (DL2JTE/HA7HN) has done extensive testing with the transformer coupling (ref. 6C/D). One of his initial loops has a diameter of 1.2 m (4 ft) and is made of 20 mm (3/4") OD copper tubing. Using a T200-2 iron powder core and 2 secondary turns, he obtained SWR = 1.01 over a frequency range of 3.5 - 10.1 MHz. He also confirmed that with an STL antenna, the position of the transformer along the loop circumference makes absolutely no difference. An other 80-and-up loop that he tested, has a diameter of nearly 3 m (10 ft) and is made of thin copper wire (0.4 mm Ø, AWG #26). 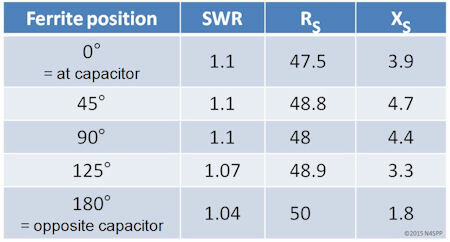 With a single ferrite core, he could not get SWR below 1.2. He obtained wide-band coupling (SWR < 1.1) with a stack of 9 ferrite cores of type T-240-61 cores (size FT-140 OK when not QRO). Eight of the cores are tightly stacked on the loop, the 9th core is only on the two secondary turns. See the diagram below. Note that he furthermore attaches a dipole across the tuning capacitor. Another variation on the toroidal transformer coupling is using a small number of primary windings, instead of just a single one. I.e., an N:M transformer. This requires the loop to be opened and the primary windings to be connected across the gap. 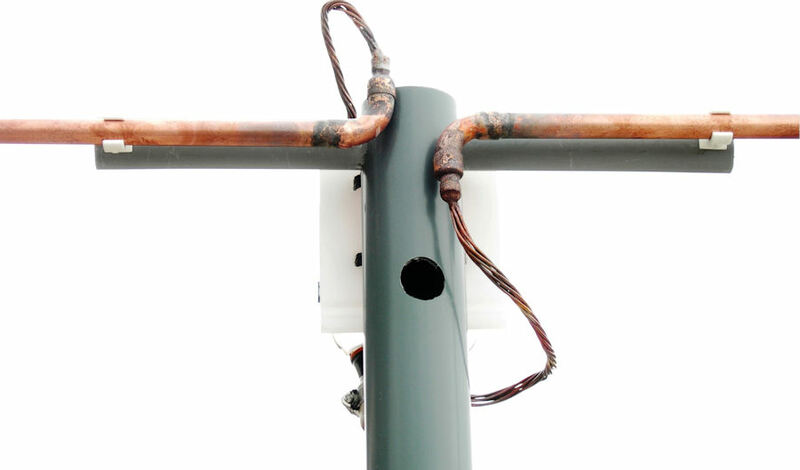 For a loop made of copper tubing, the transition to wiring may not be great. But I have no experience with this, nor references regarding its performance. Joe (W9SCXH) used 2 primary and 5 secondary turns on a small ( = QRP) T-50-2 (iron powder) core in his 30-15 mtrs square wire loop (ref. 6F). WARNING: if you are experimenting with the various forms of coupling, do NOT leave a ferrite ring on the loop and transmit via another coupling (e.g., a coupling loop, Gamma rod, or ferrite transformer). Any unused ferrite ring will try to act like a current choke, and will get fried if you transmit with more than QRP (you will see the SWR increase when that begins to happen). Another clear symptom is that the SWR=2 bandwidth will be much larger. Clearly, the voltage distribution is symmetrical with respect to the neutral point (V = 0) that is located opposite the tuning capacitor. In an STL antenna, the current distribution is basically constant. Resistance (impedance) is voltage divided by current. Hence, an STL has a resistance "distribution" that looks like the voltage distribution. The neutral point is a convenient reference point. If we move along the loop circumference, away from that reference point, we will find a point at which the resistance is 25 Ω with respect to the reference point. There is a similar 25 Ω point on the opposite side of the reference point, at the same distance from that point. Moving further away, we will find a symmetrical pair of 50 Ω points. This (admittedly simplistic) description suggests some simple methods for coupling the loop to an asymmetrical/unbalanced feedline (i.e., coax) or to a symmetrical/balanced feedline (twin-lead, ladder line). When using a coax cable as feedline, we need an asymmetrical tap on the loop. The shield of the coax is connected to the neutral point of the loop. The conductor of the coax is connected to a so-called Gamma Rod. The rod is installed parallel to the loop. At some distance from the neutral point, the rod is connected to the loop. The tap is typically made adjustable, to be able to tune the effective length of the rod. This method also does not have the operating power limitations that are typically inherent to components of the transformer and capacitive coupling methods. 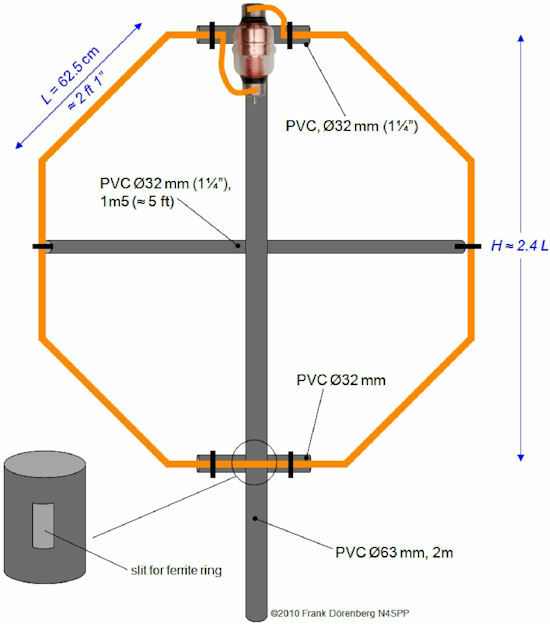 This coupling method is wide-band: reportedly as much as 10:1, if the antenna installed sufficiently clear (15-20 ft, 5-6 m) from any objects and at least 1/2 loop diameter above ground). but the exact location of the tap point does depend on the frequency. In my own experiments, I have not obtained acceptable SWR ( less than 1.5) over more than a 2:1 frequency range. The Gamma Rod adds inductance to the coupling. In a Gamma Match coupling, there normally is a variable capacitor in series with the rod, to cancel out that inductance. Ref. 6G, GH, 6J. In "magetic loop" applications, this compensation capacitor is typically omitted. However, a small series capacitor (several pF) may significantly increase the frequency range over which low SWR is obtained. As the Gamma Rod configuration is asymmetrical, the radiation pattern is slightly skewed, causing a front-to-back ratio that slightly favors the direction of the Gamma Rod mount. Contrary to the inductive coupling and transformer coupling methods discussed above, this coupling is galvanically connected to the antenna loop. In my first loop, I decided to insert a copper T-piece at the neutral point, just in case I ever wanted to play with a Gamma Rod. The T-piece is for 16 mm OD copper tubing (my loop), whereas the side connection is for 10 mm OD copper tubing. The latter is perfect for a female BNC chassis-mount jack. I drilled a hole opposite the BNC connector. A 1 m (3ft) section of heavy, insulated household installation wire is soldered to the BNC connector and passed through the hole that I drilled. That serves as Gamma Rod. A hose clamp (UK: "jubilee clip") can be used to fix the end of the wire in place at the tap point. along the loop, until the desired impedance matching is obtained"
This is not all that surprising, as the position tap point depends on characteristics of the Rod: length of the bar/wire/tubing, diameter of the rod, shape of the loop formed by the rod and the loop, center-to-center spacing between the Rod and the loop, etc. See ref. 6H and 6J, considering the main loop as a circular folded dipole that is terminated with the tuning capacitor. The position of the tap point also depends on the loop and its construction. In general, the lower the Q of the loop is (e.g., due to losses in solder joints), the farther away from the neutral point the tap point will be. Converesely, the higher the Q, the closer the tap point will be to the neutral point, and the more sensitive the position of the tap point will be: moving the tap just a couple of mm (≈ 1/8 inch) may make a difference! 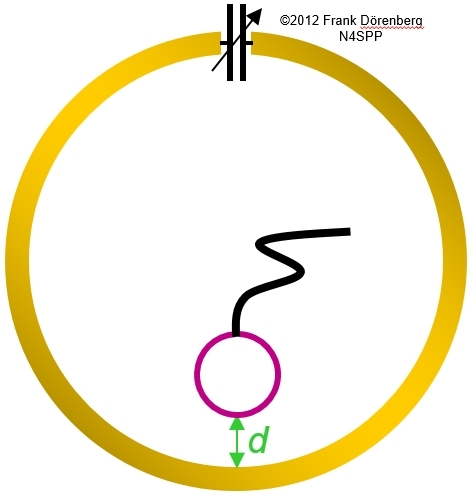 Some literature suggests the tap point at "main loop circumference / 10" from the center point, and the rod at a distance of "main loop circumference / 200". Tap point at "loop circumference divided by 15.8" from center point; rod is 1/4" diam. 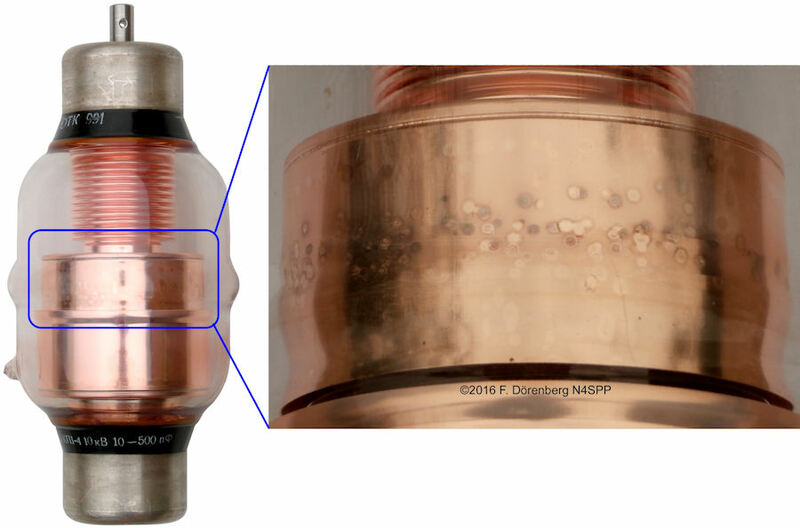 copper tube, 2⅜" (6 cm) distance from the loop(diam. 3½ ft); started half-way up the loop (i.e., 1/4 circumference from the neutral point), final tap at 8.375" (≈ 21 cm). Tap point at "loop circumference divided by 10" from the neutral point; rod at distance of 0.5% λ from the loop. Tap point at "loop circumference divided by 10" from the neutral point; rod at distance of 20 cm (8") from the loop. Loop circumference 2.4m (8 ft), rod length 23 cm (10"); 20m loop. Tap point at "loop circumference divided by 8" from the neutral point. Tap point at "loop circumference divided by 11.4" from the neutral point ; rod at distance of 7.6 cm (3") from the loop with 20 ft (6 m) circumference.. Tap point at "loop circumference divided by 7" from the neutral point; rod is 12" of 1/8" wire, spaced 1" (2.5 cm) from the loop made of 5/16" (8 mm) copper tubing. Tap point at "loop circumference divided by 4.3" from the neutral point. Tap point at "loop circumference divided by 4" from the neutral point; rod is 9"
Tap point at "loop circumference divided by 10" from the neutral point. Loop circumference 4m (13 ft), rod of 8 mm Ø copper tubing, parallel to main loop at 8 cm (3.25") distance. The Gamma Rod construction itself can also be considered as a kind of loop. If the end of tap point is chosen relatively close to center point (where the coax braid is attached) but we retain the size (area) of the loop, we end up with the Hairpin (stub) Match (a.k.a. Beta Match). Yet an other variation is the "Twisted" Gamma Match (a.k.a. "Mu-Gamma" or "G3LHZ-Gamma", ref. 3B (pp. 12, 13, 20) and 6K). I have no suggestions regarding the total length of the wire and the number of turns. If a Gamma Rod is installed on both sides of the neutral point, we have a T-Match It can be used with a 2-wire feedline. As with all antennas, the efficiency depends on the radiation resistance. For an STL, the radiation resistance at a given frequency is proportional to the square of the surface area. So, bigger is better. For a given circumference ( = total length of copper tubing), a circular loop has the largest surface area of all shapes. However, I have no access to a tube/pipe bender, and annealed (heat treated) copper tubing is quite hard and stiff. So I decided to build an octagonal loop instead of a circular loop. But as derived below, a circular loop has a surface area that is only about 5% larger than an octagonal loop with the same circumference. Note that the radiation resistance of an STL increases with the square of the loop area surface. For the same circumference, a round loop has a radiation resistance that is 1.0552 = 11% larger ( = better) than the octagon! However, that is not the entire story. Clearly, maximizing the surface area is rather important. Typically, we have room for a "loop" with a certain width and height. Let's take the simple case where "maximum width" and "maximum height" are the same. In this case, a square loop will have the largest possible surface area. Obviously this is not the shape with the smallest circumference - that would be a round loop. However, a square with a standard construction has soldered, braised or welded elbow-joints at the four corners, which may introduce loss resistance that a single-piece round loop does not have. For a given width = height = D, and all else remaining equal, we obtain the following surface areas and relative radiation resistances. Based on that, the square loop would have the largest radiation resistance (but the loss resistance mentioned above does factor into effciency...). Just to keep in mind. Anyway, I decided to make a loop with a circumference of about 5 mtrs (16 ft). The resulting octagon is then 1.5 mtrs tall and wide (5 ft). This size is quite manageable, but the circumference is sub-optimal for 80 mtrs: only about 0.06 λ. Note that the connections between the loop and the capacitor increases the circumference, but hardly the loop's surface area. The cross-shaped support is made of standard PVC tubing. The "mast" fits in my heavy cast-iron umbrella stand. An octagonal loop requires nine sections of straight copper tubing. 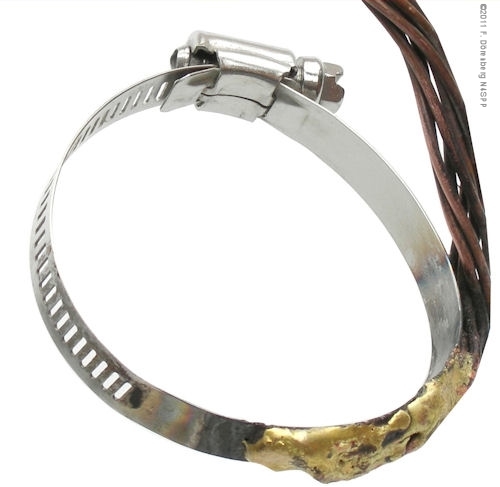 They are connected with copper elbow-pieces - no bending required. Note: industry standard is to refer to the outer diameter when talking about tubing, and the inner diameter when referring to a pipe. Just so you know, hihi. 10x12 cm (4x5")polyethylene cutting board, 8 mm (5/16") thick - from the kitchen. 2 bolts, M6, stainless (long enough to pass through the board + 2mm thickness of the 63 mm OD PVC + lock nut). 2 self-locking nuts, M6, stainless. The vacuum capacitor "bottle" is not a cylinder. I used a grinding bit to carve out recesses in the cutting board, for the shape of the "bottle". I also cut 2 x 2 slits in the board, to pass the tie-wraps through the board. Well, I actually drilled a series small holes for each slit. Each pair is spaced less than the width of the capacitor (10 cm), to be able to get the tie-wraps to pull the bottle tighter onto the board. 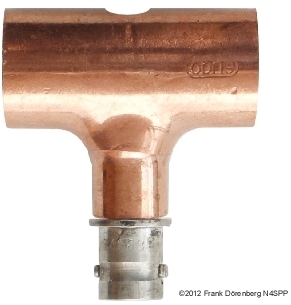 Initially, I tried to braze the copper elbow pieces to the straight copper tubing with a household propane/butane blowtorch and plumber's silver solder. Such a blowtorch just doesn't generate enough concentrated heat. So I took my pieces to a friendly neighborhood plumber, who used his oxy-acetylene blowtorch. Much better! I did do some pre-planning, and put the roof rack on the car, to bring the assembled loop back home! Obviously, an acetylene + oxygen blowtorch will do a much better job than a propane blowtorch: you can weld with it, instead of just solder. However, they are very expensive and you typically cannot rent them. But you pay a local welding shop to do it, or ask a friendly plumber (which I ended up doing). Figure 58: Another picture of this STL. As I had several FT-140-43 ferrite cores in stock, that is what I used. These cores have an outer diameter (OD) of 1.40" and an inner diameter of 0.9" (≈ 23 mm). This is large enough to slide over a tube with 16 mm (5/8") OD, and still have room for about 16 windings of insulated heavy installation wire of 1.5 mm2 (AWG 14-16). The G4FGQ calculator (ref. 2D) predicts that my loop would require 24 secondary windings at 3.5 MHz, and 8 at 14.230 MHz - for a ferrite core of "suitable grade". K3JLS (ref. 6E) uses 3 turns of 14 AWG enameled wire on an FT-240-43 core for his 40-20m loop. AA5TB (ref. 8A) used 2 turns on his 30 m loop. The curve below shows that for maximum capacitance (500 pF), the resonance frequency is 3064 kHz; with minimum capacitance (15 pF) it is around 15.8 MHz. This range covers 80-20 mtrs and is larger than what the various calculators estimated - suits me fine! Note that the connections between the loop and the tuning capacitor do add to the size of the loop. As the resonant loop is an LC-circuit, the resonance frequency varies with the square-root of the tuning capacitor's value. My capacitor has a 15-510 pF = 1:34 capacitance range. As shown above, I measured a corresponding resonance frequency range of about 3-15.8 MHz = 1:5.2, whereas the expected resonance frequency range would be 1:√34 = 1:5.8; the difference is explained by the accuracy of the capacitance measurement and the loop's parasitic capacitance. Loop calculators (such as ref. 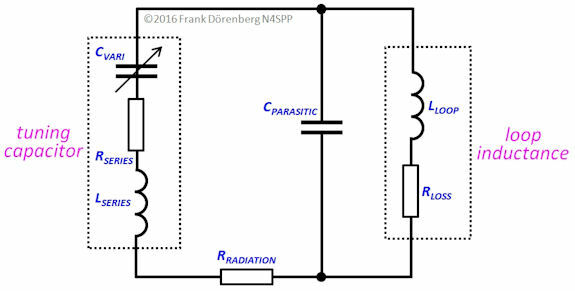 2A-2E) estimate that this parasitic capacitance is often of the same order of magnitude as the minimum value of a tuning capacitor. Note: read ref. 2F for caveats about mag loop calculators. The plot below shows that towards minimum capacitance, the capacitance does not vary linearly with the capacitor's shaft position: the frequency-vs-capacitance curve is no longer quadratic. This is caused by edge effects in the vacuum capacitor, when its concentric plates have little or no overlap. where BW is the normalized bandwidth for a given SWR (referenced to SWR=1 at fres). E.g., the bandwidth between the "half power" frequencies ( = the -3 dB frequencies) is the bandwidth between the SWR = 2.62 frequencies. The plot below shows both bandwidth and Q for the ferrite transformer coupling with 14 secondary windings. The bandwidth varies from 6.8 kHz around 3 MHz, to 50 kHz around 15 MHz. The associated Q varies from 450 to 300, with a maximum of 600 around 5 MHz. In the above tests, the plane of the loop (not the opening of the loop!) was pointing at the remote receiver. When I turned the antenna 90 degrees, the S-meter of that receiver went down by roughly 2 points (12 dB). In November of 2010, I did some comparative receive tests with the loop and my short "Cobra" dipole (2x7 m). A coax relay allowed quick A-B switching. The loop was noticeably quieter than that dipole, and a couple of S-point stronger. I also ran some tests on 40 mtrs with my dear friend Rolf, DF7XH, at a distance of 750 km (465 miles). With all my other antennas (short dipoles and short verticals), we only have marginal communication at best. This time it was FB and 59+ in both directions. I also did a quick experiment by installing the loop horizontally. It appeared rather "deaf" on 80 mtrs, since it is installed at only 2 mtrs ( = 0.025 λ) above ground, and the ground is "poor" (concrete). As I am not interested in local QSOs, I did not pursue this. The mast of my STL is installed on top of another PVC mast with a PVC T-piece. I cut a slit into the T-piece, so it can be clipped onto the STL mast and still hold tightly, without needing to glue anything. 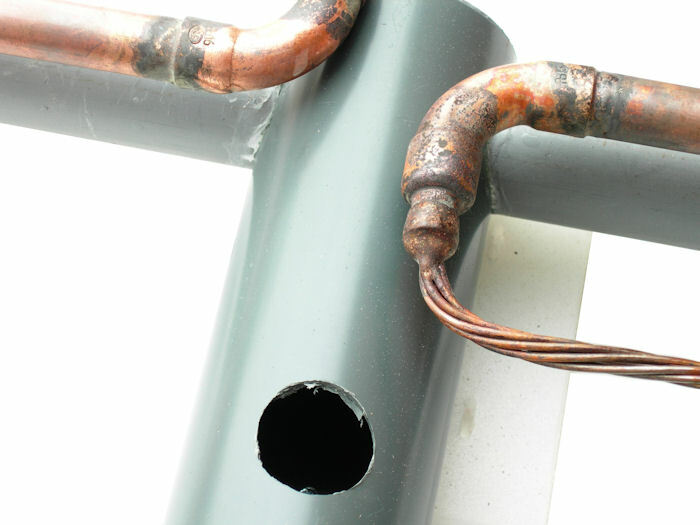 Reduce the losses in the loop by reducing the number of joints: bend long copper tubing into a circular or octagonal. After about a year and half after construction, the total DC-resistance of the copper part of the loop has not changed: still at 3.2 milliohm (measured with an HP4328A professional milliohm meter). I realize that this says nothing about RF losses. However, the resistance between the copper wire and the stainless steel hose clamps had increased to a little over 4 milliohms - per clamp! This kills the efficiency of the antenna. All loop calculators (ref. 2) will quickly show this, and I had already noticed a decline in performance over time. Note: read ref. 2F for caveats about mag loop calculators. Increase the loop circumference from 5 to about 7 m (16 to 23 ft). I.e., from 0.06 λ to almost 0.09 λ on 80 mtrs. This is still well below the optimum 0.15 λ, but on 80 mtrs that optimum implies a diameter of 4 m (13 ft)! 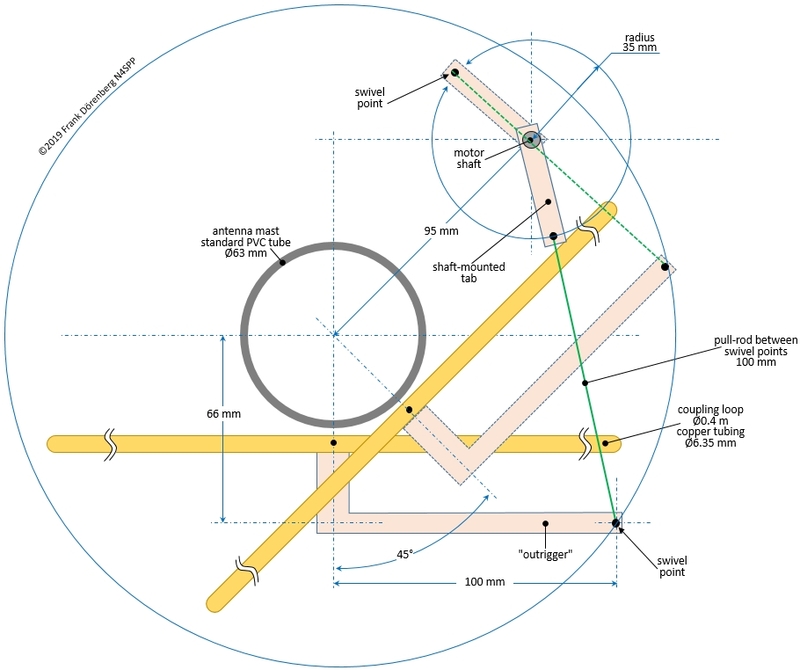 The increased size will double the area of the loop, and should more than double the efficiency of the antenna on 80 m! Try a Gamma Rod coupling, or change over to ferrite rings made of material type 31. This should be better than type 43 material for frequencies below 10 MHz. 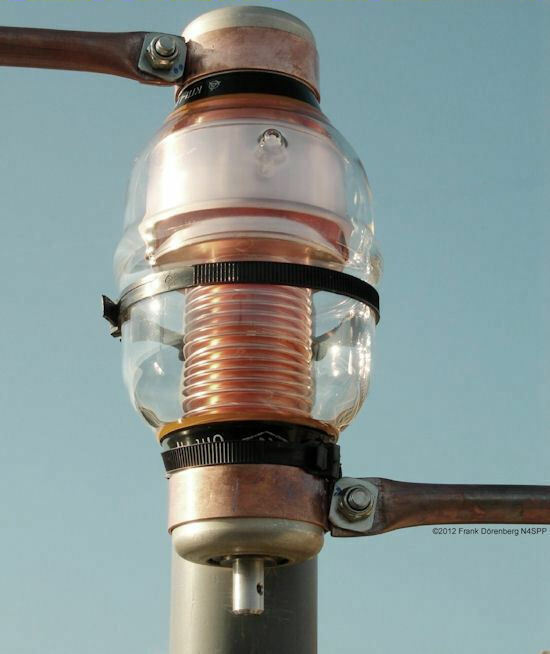 Simplify the attachment of the vacuum capacitor to the mast. Obviously, I had to make an new loop and mast - which is what I did late 2012. Don't make the mistake to assemble a loop of this size inside the house: it probably will not fit through a regular door. Don't paint yourself into a corner, hihi. I made clamps for the vacuum capacitor out of soft copper strip, about 2-3 cm wide (≈1") and 2-3 mm thick (≈0.1"). I have toyed with the idea of silver plating the copper loop and clamps to further reduce RF loss resistance (ref. 9A), but that may not be worth the effort (see half way down the page of ref. 9B). The clamps are dimensioned such that the inner circumference is just about 1-2 mm too small for the end-caps of the capacitor. This way, when I tighten the bolt of the clamp, it is nice and tight. I used stainless steel bolts and a heavy stainless washer on both side of the clamp. I squared the washers to make them fit better, and also to make them touch the full width of the circular part of the clamp. I (carefully) pinched the ends of the copper loop with a pair of vise-grip™ (locking) pliers. The "bottle" of the vacuum capacitor is now attached directly to the mast, with two large tie-wraps. With my first STL, the tie-wraps were passed through slits in the mounting board. Here, they are passed through slits in the PVC mast. The tie-wraps do not full immobilize the capacitor. However, once the ends of the copper loop are attached to the clamps, the installation is quite stable. 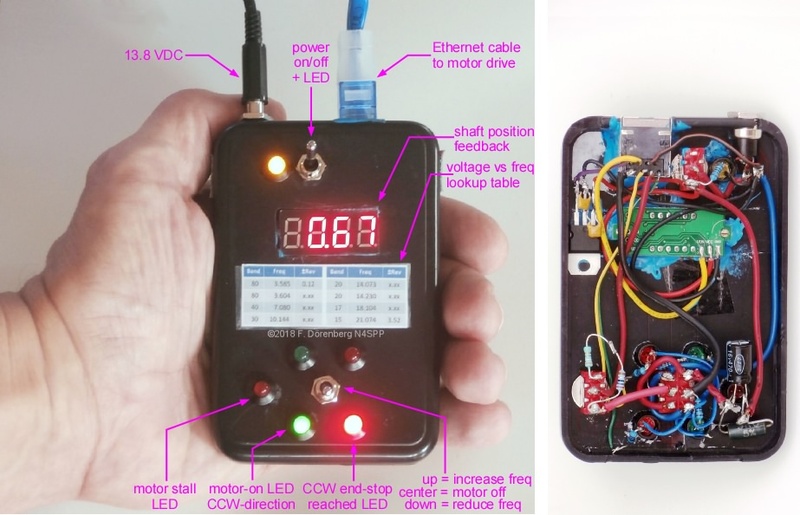 I finished building the loop in January of 2013, and took some measurements with my miniVNA analyzer. I used an FT-240-31 ferrite ring for coupling. The first measurement, with a single secondary winding (just a wire stuck once through the ferrite ring), showed an impedance of about 10-12 ohms. So, I needed a 4:1 transformation ratio to get close to 50 ohms. I.e., a 2:1 current transformer. So I doubled the number of secondary turns to 2. I also added a 1:1 current choke right at the coupling transformer. 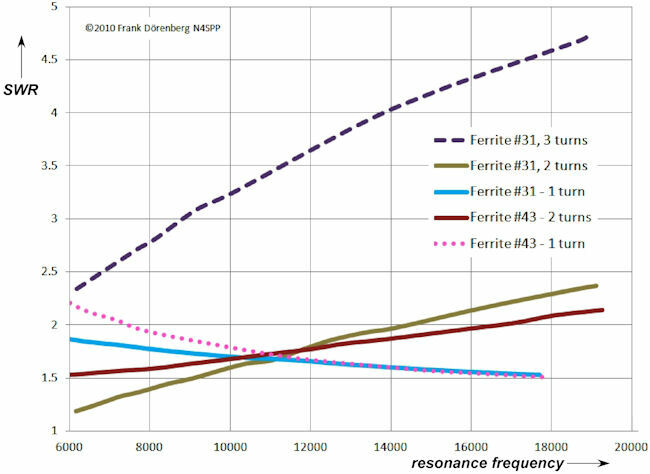 The plots confirm the suitability of type 31 ferrite material for the lower frequencies. I also tried a standard 1:5 size coupling loop, made of standard 1/4 inch (6.3 mm) soft copper tubing. I mounted the coupling loop onto the 63 mm PVC mast with PVC clamps, so its position is easy to adjust up & down, and rotate around the mast. Initially, I had mounted the coupling loop with the BNC connector at the bottom, i.e., near the main loop. As I had the BNC connector on the outside of the coupling loop, the gap between the coupling loop and the main loop is rather large. SWR was good, but I wanted to get the most out of it. Instead of making a coupling loop with the BNC connector on the inside, I just turned the coupling loop upside down. 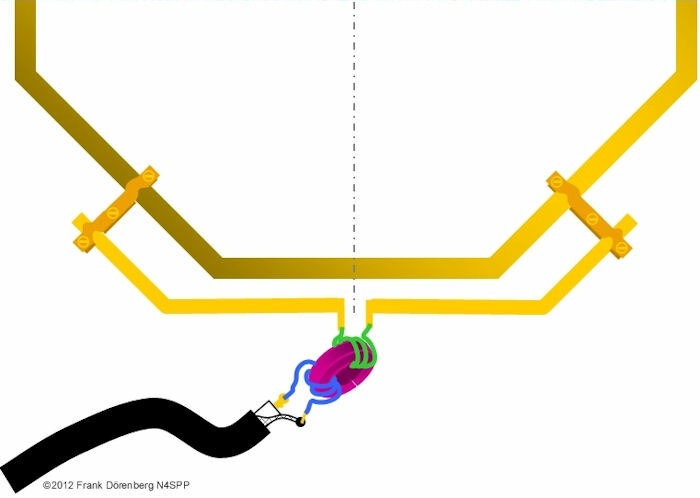 Now the coupling loop could be placed very close to the main loop. Also see the coupling discussion around Fig. 25-27 above. 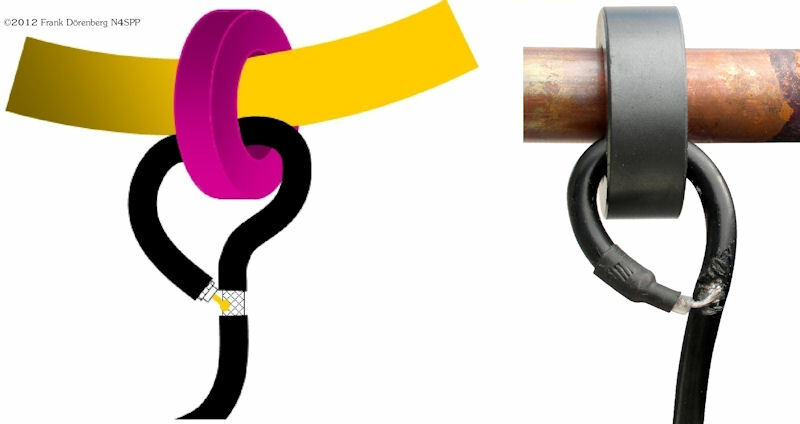 Note that in both photos, the plane of the coupling loop is not aligned with the plane of the main loop: the coupling loop is rotated about the mast until lowest SWR is obtained. So, it sticks out both sides of the plane of the main loop. However, for minimum SWR, the angle between the two loops is larger in the photo on the right. This is to be expected, as the coupling is tighter. Had the coupling loop been slightly smaller, the required angle would also have been smaller. With both configurations, SWR is quite good over a frequency range of at least 1 : 3 (in my case, 80-30m). The second configuration is basically perfect over that range. The small bandwidth confirms the very high "Q". The table below shows the efficiency and "Q" of my antenna, calculated based on the measurements in Fig. 86A: "Q" is 845 and efficiency is around 3.4% (which is about right for a decently constructed loop with a circumference of about 7% of the wavelength). I prefer this type of coupling loop to the ferrite ring transformer coupling methods. Reason: easily adjusted, no power limits, larger frequency range. There are operators who claim that an STL antenna works just as well (or poorly, as the case may be) indoors as outdoors. I believe this to be nonsense, or pure coincidence at a particular indoor and outdoor placement (and I don't believe in coincidence). 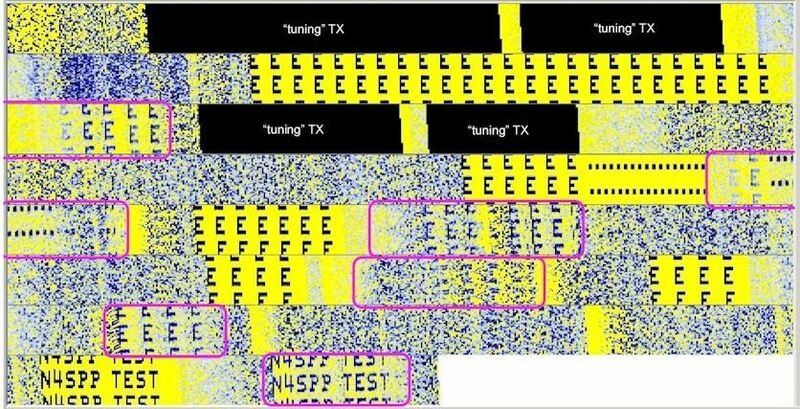 For simplicity, let's define "antenna performance" as the resulting signal strength (field strength) at the receiving station, and vice versa for reception. All objects near the antenna influence the antenna's radiation pattern, as some radiation will reflect from them, or refract around them. Furthermore, conductive objects (metals, plants, trees, people and other animals, soil) couple with the antenna, and put a load on it. Note that antenna radiation pattern diagrams are typically for onobstructed free space, and change drastically when ground is introduced, or other objects. Antenna performance not only changes significantly when going from indoors to outdoors. 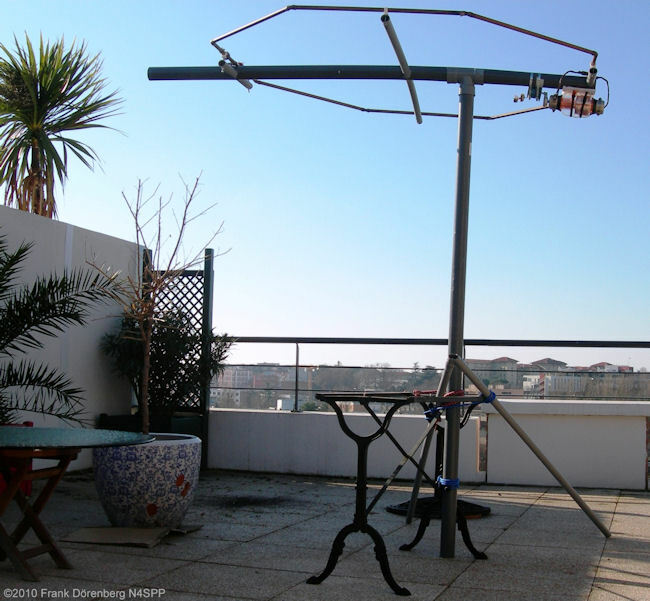 When moving the antenna around outdoors, the antenna performance also depends on the location with respect to other objects. 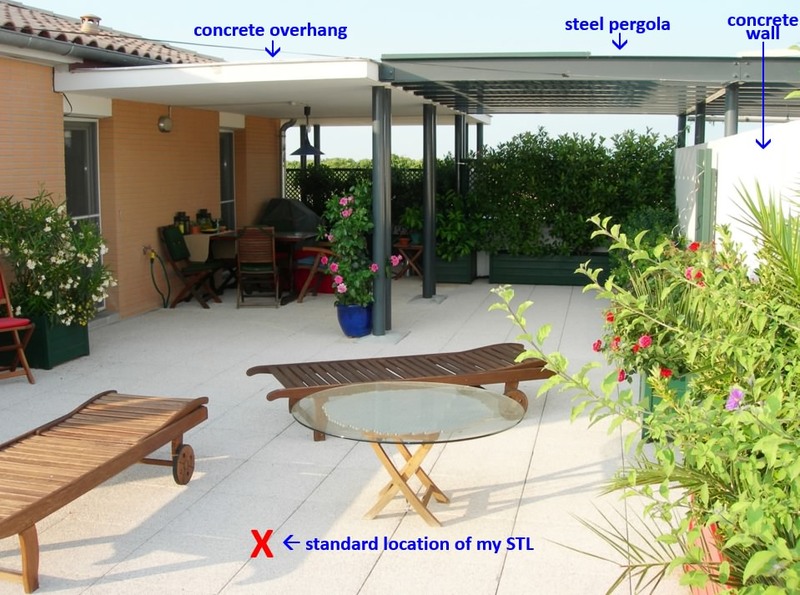 Example: the standard placement of my STLs is at the center of my terrace (see ppoint "X" in the photo below). At this position, my STL is half way between two parallel reinforced concrete walls: the outside wall of my apartment, and the wall between my terrace and my neighbor's terrace. These walls are spaced by 6 m (20 ft). The floor of the terrace is also reinforced concrete. At one end of the terrace, there is a reinforced concrete overhang and a grounded, heavy steel I-beam pergola to the wall with the neighbor's terrace. On top of the overhang, there is a free view in all directions, and the antenna is about 25 m (80 ft) above street level. When I put my antenna here, pointing in the same direction, two things happen. First of all, SWR changes from 1.1 to 1.3. Not as good (power is reduced by a percent or 2), but I did not bother to adjust my coupling loop. Despite this deterioration, my signals at a DX receiving station on 80 mtrs increased by 1/2 to 1 S-point, i.e., 3 to 6 dB. This is equivalent to doubling to quadroupling the power! My loops are installed on the terrace of my penthouse apartment, so they are quite accessible. Even so, it is entirely impractical having to go outside several times to manually adjust the capacitor position when changing operating frequency, or when the resonance frequency drifts away for whatever reason. Standing next to the loop also de-tunes it a bit. The loop has a very narrow bandwidth, esp. 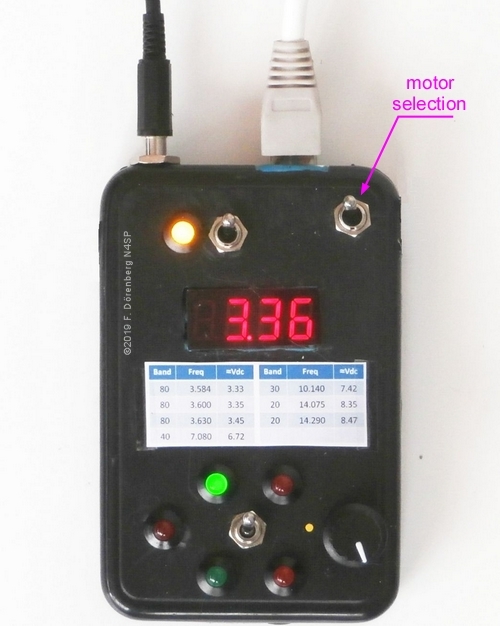 on 80 m. A remote-controlled motor-drive for the capacitor is a must! The basic motor options are a stepper motor (D: Schrittmotor, F: moteur à pas), and a DC motor. Especially with a DC motor, down-gearing will be required. When I built my first STL, I could not figure out an easy way to motorize the vacuum capacitor with a DC-motor, while providing end-stop protection at both ends of the motion range of the shaft (36 revs). So, why not make a little science project out of it? Note that "precision" and "accuracy" are not on this list. I am not particularly interested in the ability of the drive-system to move exactly to some (pre-)selected position, or exactly follow some predefined acceleration and speed profile. Depending on the outside temperature, the alignment of the moon, planets and the stars, etc., the exact capacitor shaft position for a given resonance frequency will vary. So, one will have to search around a bit anyway, for fine-tuning. It is important, however, to change the position just a tad. The first design parameter for the motor-drive is the torque required to overcome the stiction (static friction), and turn the shaft of the variable capacitor. This drives the size of the motor and reduction gear (if required). Variable vacuum capacitors have a torque value that depends on the position of the capacitor (mid-range vs. close to the end-stops), and the direction (towards or away from an end-stop). I do not have the data sheet of my Russian capacitor. To get an order-of-magnitude idea, I checked the values for a comparable capacitor (25-500 pF, 10 kV test, 9 inch length) manufactured by Jennings: 6 inch-pound (in.lb) or 6 x 0.113 ≈ 0.68 Nm = 68 Ncm. I then decided to measure it myself ("trust, but verify!"). This is actually quite easy to do! I clamped a standard 30 cm (1 ft) ruler onto the shaft of the capacitor with a small C-clamp. Pushing slowly down onto a kitchen scale until the shaft barely turns, and read the "weight". Voilà. See photo below. The force was applied to the shaft with half of the ruler, i.e., an arm of 15 cm. Depending on the turn-direction, I measured about 80 to 100 grams at positions up to mid-range (starting at minimum capacitance). 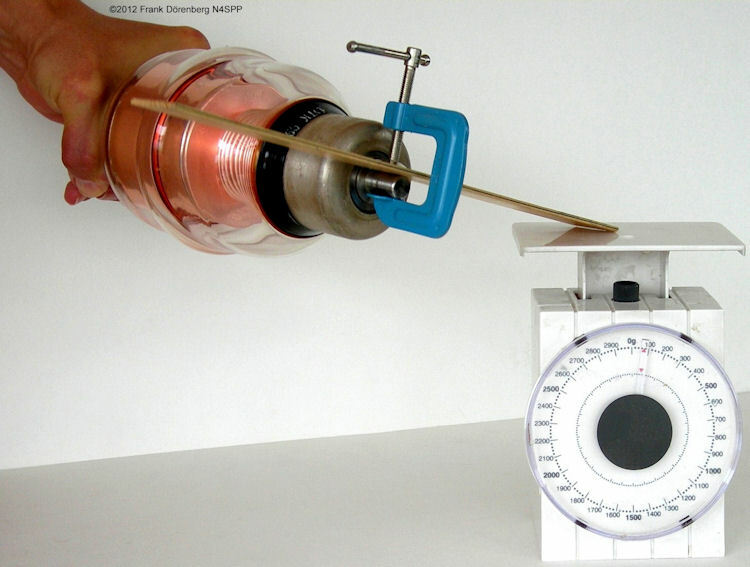 So, the applied torque was (0.1 kg x 9.8) x 0.15 m ≈ 0.15 N.m = 15 N.cm (≈ 21 oz.in). Somewhere mid-range, it became harder to turn the shaft, and I needed to apply about 140 gram, i.e., 20.6 N.cm (≈ 29 oz.in). I needed about 300 gr to get completely to the opposite end (maximum capacitance), i.e., 44.1 N.cm (≈ 63 oz.in). I cranked it up to 1000 gr without breaking anything, i.e., 150 N.cm (≈ 208 oz.in). If the motor-drive (motor + gearing) delivers less than this, I do not have to worry about not having end-stop protection. I decided to not measure the torque required to go beyond the end-stop of the capacitor, hihi. The second important design parameter is the angular resolution of the motor-drive. 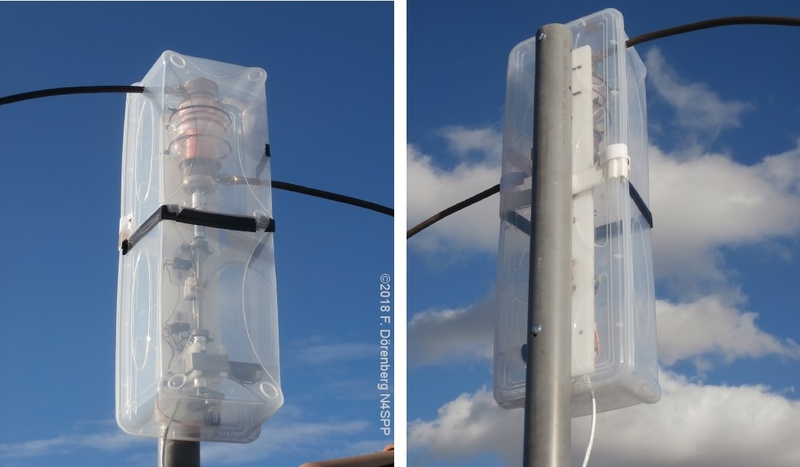 The loop antenna has a large Q, or - equivalently - a very narrow bandwidth. The motor-drive must be able to make angular displacements that are small enough, such that the associated capacitance change does not change the resonance frequency more than a fraction of the bandwidth. Otherwise it will be next to impossible to tune the resonance frequency close enough to the desired operating frequency. A capacitance change of 1 pF results in a calculated change in resonance frequency of 4.2 kHz. I.e., 0.24 pF per kHz. Calculated bandwidth is about 52 kHz. I actually measured 61 kHz. 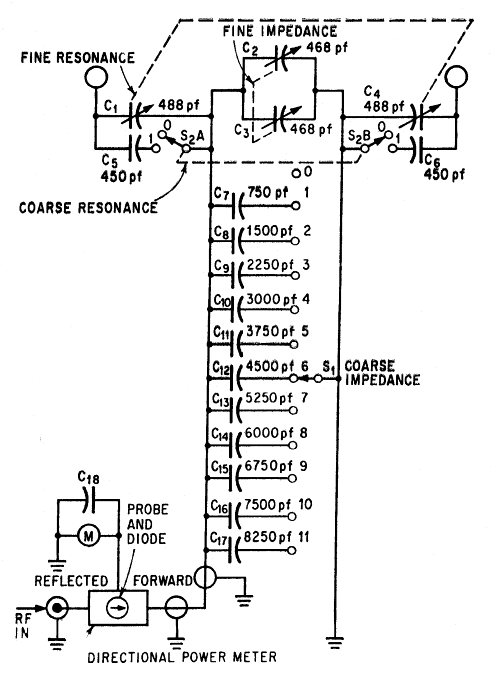 A capacitance change of 1 pF results in a calculated change in resonance frequency of 275 kHz. I.e., only 0.004 pF per kHz. Clearly, variation around the minimum capacitance (highest frequency) is the critical case! Let's assume that practical tuning requires changing the resonance frequency with a resolution that is better than 20% of the bandwidth. The above data implies a required resolution of better than 20% x 52 kHz = 10.4 kHz. That is: 10.4 / 275 kHz/pF = 0.038 pF! Based on the 0.04 pF / degree change in capacitance as estimated (assumed) above, I need an angular positioning resolution of better than 0.038 pF / 0.04 pF/deg = 0.95 degree. Note that an air variable capacitor goes through its capacitance range in a single revolution of the capacitor shaft. For multi-band tuning (large capacitor value), this implies a positioning resolution that is at least an order of magnitude better than what is needed for a multi-turn (10-40 turns) vacuum variable capacitor! A secondary design parameter is the minimum drive speed. We don't want to wait an hour for the capacitor position to move from min to max value, or vice versa. 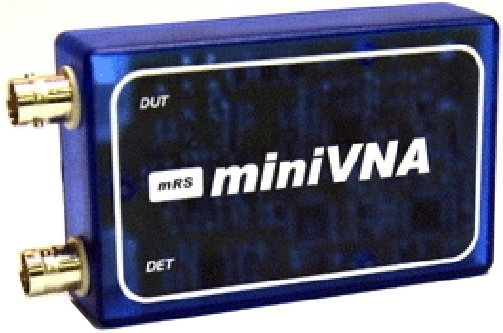 My capacitor requires 36 turns for this min-max range, which should cover the 80-20 m bands. If I could live with 1 minute, that would be 36 rpm at the capacitor shaft = 0.6 rev/sec. DC-motor with gearing + position feedback (unless you just want to move the motor while observing the SWR or antenna impedance and don't care about the motor position). If the DC motor is not a brushless type, then (as a minimum) a noise suppression capacitor must be installed across the motor wires. Otherwise the brushes will generate electrical noise when tuning the antenna in receiver mode. 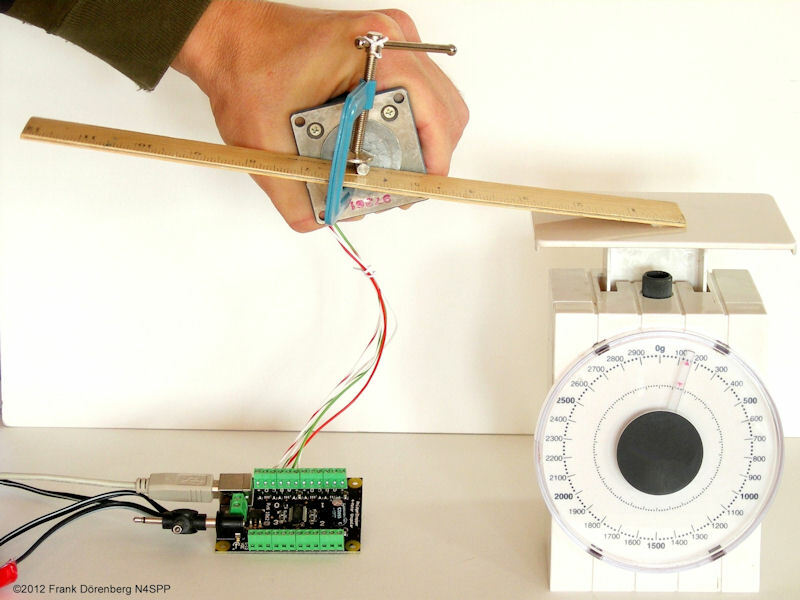 Open-loop control of a DC motor is simple. Apply DC power with the correct polarity, and turn of that power when at the target position. Speed can be controlled (again: open-loop control without position feedback, no speed regulator) with a cheap and simple Pulse Width Modulator (PWM) circuit, such as I used for my third STL. Small DC-motors with large down-gearing are relatively inexpensive. When one of my colleagues donated a stepper-motor (thank you Helmut! ), I decided to throw all caution to the wind, and go with that. It is an old Slo-Syn SS25-1001. This is a 5-wire brushless permanent magnet inductor motor that can be operated as a constant-speed AC synchronous motor, and as a 1.8º uni-polar DC stepper motor. As I needed better than 0.95 deg positioning resolution, at least 2:1 gearing is required. holding torque (a.k.a. break-away torque): the amount of torque required to break the shaft away from its holding position, with motor at standstill and coil(s) energized with rated current & voltage. pull-in torque: max torque at a given speed, for stopping/reversing without losing sync. pull-out torque: max torque at a given speed, without losing sync or stalling. residual torque (a.k.a. detent torque): torque produced by the motor's permanent magnets, when no coils are energized. The holding torque and residual torque are not interesting for my application, as the motor will not be holding a load. 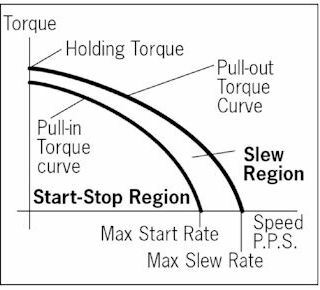 Of interest are the pull-in and pull-out torque, typically provided as a torque vs. speed curve. The curves are highly dependent on the type of motor-driver that is used. I do not have the torque curves for this motor, but typically it appears to be about a factor three smaller than the holding torque. That would imply a torque of about 10 oz.in (7 N.cm). Less than half of what I need! But why not determine the actually required torque, the same way I measured the required torque. With the motor energized, just make the "arm" push down on the scale until the motor turns. With my simplistic kitchen scale method, I measured a break-away torque of approximately 140 grams x 15 cm = 2100 g.cm = 20.6 N.cm = 29.2 oz.in. Almost exactly as specified! The same value is obtained by fixing the motor in place, and commanding it to turn, one step (or 1/2-step) at a time until it "pops". This very easy to do with the controller software I wrote (see further below). Keep in mind that I need at least 44 N.cm (≈65 oz.in). So I have to add down-gearing of at least 3:1. The SS25 is a 5-wire device. 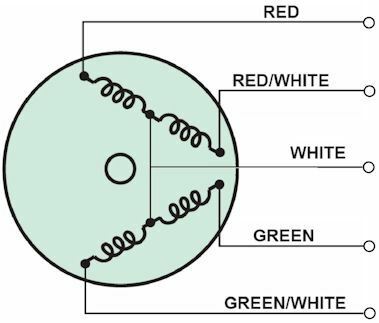 It has a common wire (white) and four coil wires (green, green/white, red, red/white, for coil 1-4). This corresponds to the connections "+", and A-B-C-D on the Phidgets motor controller card that I use. We have a motor, so now we need to control it. I wanted to control the motor from my PC, rather than having a separate control box. This means that the controller hardware must have an interface to the PC. Standard options are an RS232 interface via a COM port, or - more modern - a USB interface. My PC only has one COM port, and that one is already used for the PTT-interface from the PC to my transceiver. Yes, I could add a USB-serial interface. But if I go USB, I might as well skip the RS232. The main choice to make now, is "make" vs. "buy". Yes, there are many stepper-motor controller hardware designs floating around in cyberspace. Few have a USB interface. I determined that piecing a design together, building and debugging it, was too much of a hassle. Instead, I searched for a relatively inexpensive off-the-shelf USB solution. I decided to go with a Phidgets 1062 controller card. 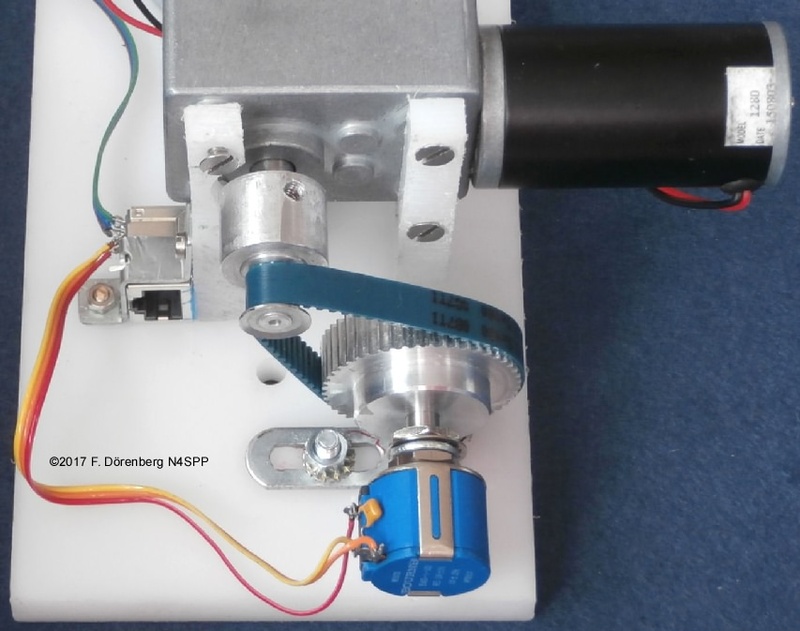 It handles up to 4 unipolar stepper motors simultaneously (e.g., an antenna rotor as well). It is almost "plug-and-play", via USB. This controller card is really tiny: 5 x 6.3 cm (2 x 2½ ")! And: it is rated for 1 amp per winding, without a heatsink! It does come with some rudimentary software, to check out the card and the motor. The unipolar Phidgets card (model 1062) does not support speeds above 383 half-steps per sec! That is almost 1 rps with a 1.8 deg stepper motor (200 full steps/rev). Phidgets also sells a controller card (model 1063) for a single bipolar motor. As the name suggest, control of bipolar stepper motors involves changing the polarity of the applied voltage across the motor windings. This makes bipolar controller hardware inherently more complicated (typically H-bridges instead of simple transistor switches). 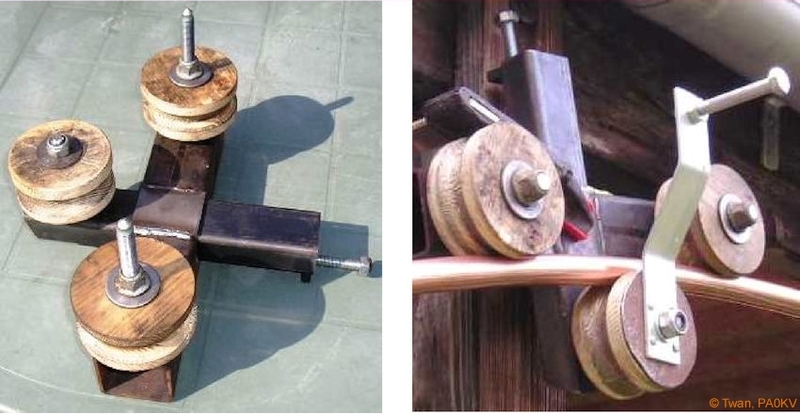 Yes, unipolar motors are very old-fashioned and generally produce less torque then bipolar/hybrid steppers. The latter can also be micro-stepped, whereas half-stepping appears to be the limit for unipolar motors. The bipolar controller card supports much higher speeds, and also has 4 discrete/digital inputs. The instruction set of the Phidgets 1063 card is a super-set of the 1062's instruction set. I.e., the 1063 has all functionality of the 1052 - and some additional functions. E.g., limiting the motor current (= torque). This means that the control software that I developed for the 1062 will also work with the 1063. Leslie, EI5GJB, has confirmed this (November 2011) and is quite pleased! The "Motor Hawk" card. Twan van Gestel (PA0KV) has made a big loop (160-40) with a Gamma match, and used one of these cards for a stepper motor in his 2015 design. He made nice controller software in Visual Basic. See here. Both come with more useful demo software than the Phidgets. The next step is choosing a mechanical coupling of the motor to the shaft of the variable capacitor, including the necessary down-gearing. IMPORTANT: you need non-conductive material or rod to couple the motor to the capacitor. The capacitor shaft is not insulated from the capacitor itself. Hence, it is at the same potential as the capacitor (up to several kV at resonance). You don not want the capacitor voltage on the motor (or its wiring)! Standard options are using a non-conductive (plastic, ceramic) driveshaft or a belt drive. 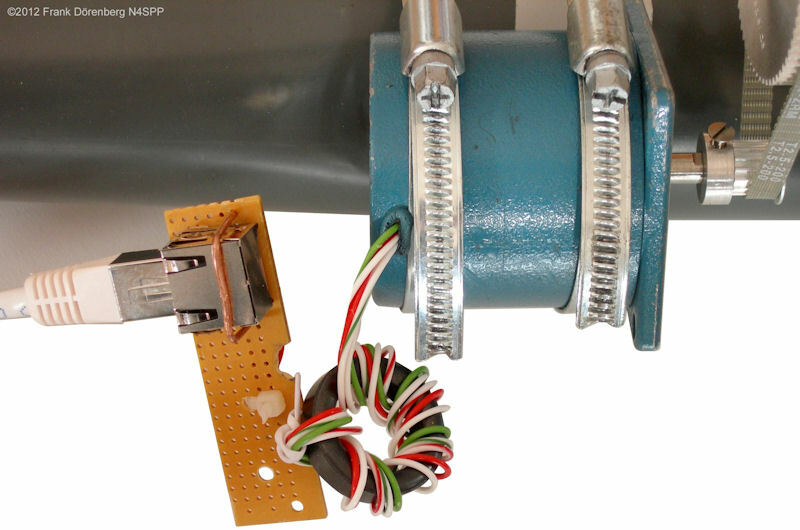 The shaft and housing of the motor, and any metal gear wheels attached to it, must remain at a safe distance (at least 1 cm (1/2") from the shaft and connections of the capacitor. I would have preferred a straight, rigid shaft-to-shaft coupling. But as as determined above, my motor doesn't generate enough torque for 1:1 coupling: I need down-gearing of at least 3:1. The easiest way to do this, is with pulleys (cog wheels) and a timing belt. A timing belt (a.k.a. toothed, notch, cog, synchronous belt; D: Zahnriemen, F: courroie dentée) has teeth that fit into a matching toothed pulley. When correctly tensioned, there is have no slippage: motor and load remain "synchronized". Timing belts need the least tension of all belts, and are among the most efficient (though no issue at very low speeds of a few RPM). Standard belts are fiberglass reinforced neoprene or polyester-urethane (PU). There are several standard belt profiles, but this is not critical in our low speed, low torque application. The basic choice was between a simple T (trapezoidal) profile with 2.5 mm pitch and 6 mm width, vs. 5 mm pitch and 10 mm width. There is a finite choice of standard pulleys. The standard number of "teeth" is typically 10-20, 22, 25, 28, 36, 40, 48, 60, 72, or 84. The diameter of the pulley is determined by this number, and the pitch of the belt (i.e., the distance between the centers of adjacent teeth). It is recommended that at least one of the two pulleys has flanges, to avoid the belt from running off the pulleys when the input and output shaft of the gear are not properly aligned. Standard materials are aluminium and plastic (typ. acetal resin). Pulleys for a T5 belt are significantly larger than for a T2.5 belt. Pulleys have standard bore sizes. I did not want the pulley on the capacitor shaft to be larger than the end-connector of the capacitor (60 mm diameter). I want to be able to create a 3:1, 4:1 or 5:1 gear ratio. The diameter of the hub of the pulleys has to be large enough to increase the bore (with a drill press!) to the respective shaft size, and still have at least 2 mm hub thickness left. The height of the hub has to be enough to allow drilling a radial hole, thread it, and use a set-screw (grub screw) to fix the pulley onto (or through) the shaft. I settled on a T2.5 x 6mm belt, a 60 teeth pulley (48 mm diam.) for the capacitor shaft, and a 15 teeth pulley for the motor. I.e., a 4:1 ratio (I also got a 10 teeth pulley, just in case I needed 5:1 gearing, but did not need it). For the diameter of the selected pulleys, and a minimum of 2 cm spacing between the pulleys, I ended up with a standard belt with a 200 mm (8") overall length (80 teeth). I.e., a standard T2.5 x 6 x 200 belt. I installed the motor onto the antenna mast with two "worm drive" hose clamps (a.k.a. radiator clamps; UK: "jubilee® clips"). NOTE: I had to revise my choice of belt material! 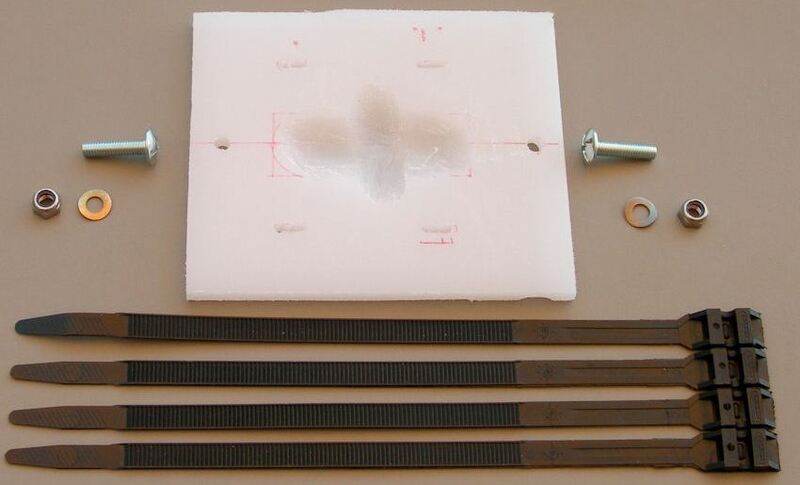 The original belt was reinforced with embedded steel tension cords. As you can see in the photos below, this caused arcing between the belt and the pulley of the motor. Luckily, no damage was done to the controller card, PC, or my transceiver. Clearly, one must use polyurethane or neoprene belts that are reinforced with fiberglass, polyester, or polyurethane cords! Standard Cat 5 (category 5) cable; this is for 10/100 Mbs Ethernet communication - no need to go for Cat5e or Cat6 cable (100/1000). This is an 8-conductor cable, usually 4 twisted-pairs. There are UTP (unshielded twisted pairs) and STP (shielded) cables. STP is recommended for the application at hand. 6 or 8-wire phone cable. The advantage of an 8-conductor cable is that this leaves 3 conductors to accommodate a sensor at the motor drive, e.g., a potentiometer or end-stop switch. Of course, it can also accommodate an 8-wire stepper motor. As I had several long Cat5 cables laying around, I settled for one of 15 mtrs (50 ft). With two mating RJ45 chassis connectors (8P8C modular jacks), I'm in business. The controller card takes its power from the USB port, but only for the control electronics - not to power the motor! The latter power must be supplied separately to the card: either via a standard barrel connector, or hardwired to a terminal block. My motor uses 12 volt DC. I use the barrel connector and a 12 V / 750 mA "wall wart" power supply, or a sealed 12 V / 4 Ah motor cycle battery. IMPORTANT: As noted in the warning section above, the antenna generates strong a RF field when at resonance - enough to light up a fluorescent light tube, with just a couple of watts transmit power. You do not want to get this RF into the controller card and damage it, or into the PC connected to it. As for most of my HF-chokes, I use FT140-43 ferrite rings. One is placed at the controller card, between the RJ45 connector and the card. I use a short section of Cat 5 cable between the connector and the card. This cable is wound 5 times through the ferrite ring. This has been adequate so far (I use 100 W max). According to various loop antenna calculators, the highest capacitor voltage for my size antenna, occurs for a resonance frequency around 7 MHz. Running 100 W into the antenna - with the controller card operational - did not cause any damage or abnormal behavior. I may move the motor away from the capacitor, to the "neutral" point opposite the capacitor. This requires a long, torsionally-stiff drive shaft. I found very stiff green plastic rods of 1.8 m (6 ft) length and 16mm diameter in the gardening section of the local do-it-yourself store (thanks for the idea Mark, KF7KIN). Be careful: some of these green garden rods are just plastic-coated metal tubes or rods. It is not easy to tell! I ended up with a 1.8 m section of regular 16 mm PVC electrical conduit. It is flexible, but torsionally stiff. The bore of my large gearwheel is 12 mm, as is the diameter of the capacitor-shaft. Adapting the 16 mm rod to the 12 mm bore (inner diameter) is easy, with a 16-to-10 mm copper adapter piece. It has 1 wall-thickness of 1mm, so 10+1+1= 12 mm outer diameter. I pressed it in with the bench vise. Adapting the 16 mm rod to the 12 mm outer-diameter of the capacitor shaft is equally simple, with a 16-to-12 mm adapter piece. The store didn't have that one in stock, so I used a 3 adapters: 16-to-10, 10-10 (female-female), and 10-to-12 mm. I will install a ball bearing with 16mm bore on the rod, close to the motor. Obviously, the Phidgets motor controller card needs to be controlled from my PC. This requires the user (me) to somehow create software. The Phidgets website provides a library of dll and API files, and some simplistic code samples and low level suggestions on how to control the card via Visual Basic, C/C++, LabView, MatLab, Java, etc. I decided to go with LabView, because I have access to it, and it is graphically oriented (both design and the controller). It has taken me over a week of spare time to learn "LabView 8 Pro" well enough to make a quite decent controller with a nice Graphical User Interface (GUI). My GUI has three tabs: "Control", "Cal", and "Config". Next time around, I may have a go at Visual Basic, though it is limited to "Windows". The development tools are basically free, whereas LabView is prohibitively expensive for private use. And unlike LabView, no enormous Real Time Operating System needs to be installed. Indication of whether the software has established contact with the Phidgets card. A toggle switch for commanding the Phidgets card to energize the motor. Default is de-energized. A LED indicates energization status feedback from the card. Note that the card does not know whether a motor is actually attached or electrical power is available, so this (and of other parameters such as speed and position) is only a feedback of the commanded state. Type-in the desired antenna frequency (followed by "enter" on your keyboard), with incremental up/down buttons (+/- 1 KHz). Radio-buttons for eight preset (and configurable) frequencies. A magenta slider (with incremental up/down buttons, +/- ½-step) to command motor position, rather than frequency. There is a push button next to this slider. When pushed, the slider position is synchronized to the actual motor position. This is useful when using a pre-set frequency, and needing to tune around this position. Two blue sliders that indicate the selected motor position and the actual motor position. The associated numerical positions are expressed in both motor ½-steps, and revolutions of the tuning capacitor. The upper limit of all three control & indicator sliders is initialized based on the gear ratio and the number of 1/2 steps per motor rev. 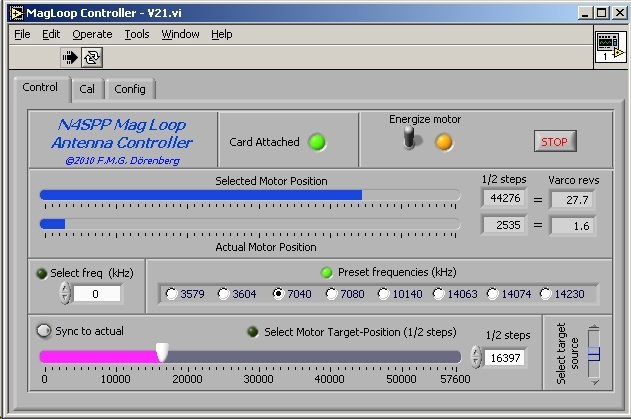 Note that the actual motor position is not measured - the controller card just keeps track of how many steps it commanded with respect to the initialization position. A "stop" button, that halts execution of the control software and commands the controller card to de-energize the motor. If a desired frequency is selected (numerical entry or preset), then the software interpolates the antenna's calibration data to calculate the corresponding motor position. This interpolation scheme, and assigning the labels of the radio buttons based values read from a file, was the trickiest part of the software design! Note that the calibration data is only valid at a certain temperature and position or the antenna. E.g., if the data was obtained with a cold antenna, and the sun (or QRO operation) heats it up, then the actual resonance frequency will drift. When turning a vacuum capacitor, there is no need to apply holding torque when not moving (unlike other applications. Hence, there is no need to keep motor energized while at rest. However, no harm is done when the motor is kept energized, and turning the energization on & off for each movement makes the controller software more complex. Also, when the motor is re-energized, it may jump a step. So: my controller software keeps the motor energized (with manual override). 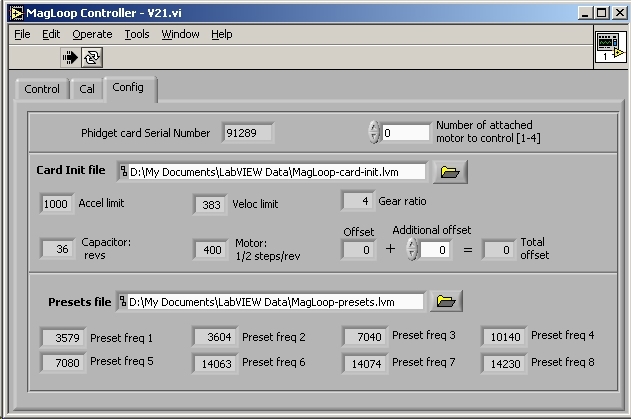 Initialization settings for the Phidgets card and the controller: acceleration limit, velocity limit (½-steps/sec), the number of ½-steps per revolution of the motor, gear ratio between the motor and the tuning capacitor, offset (½-steps), number of capacitor revs for end-to-end travel. Preset frequencies of the operator's choice. 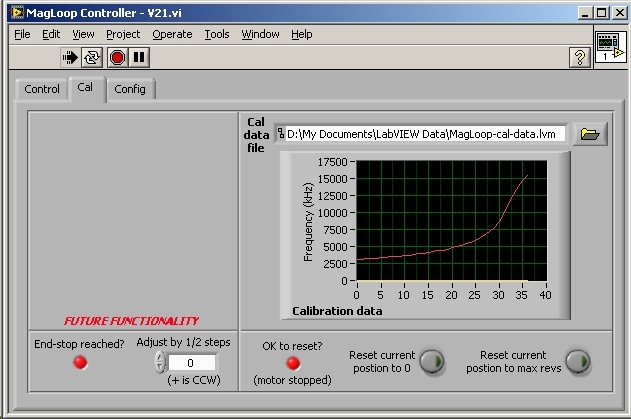 Calibration data (resonance frequency of the antenna, measured for each full revolution of the capacitor shaft). Obviously, the calibration data from my antenna will not be correct for someone else's antenna (or my own antenna at a different location). Indication of the serial number read from the Phidgets card. Setting of which motor to command (the Phidgets 1062 card handles four motors; default is 0). Note: this not the number of motors that are attached to the card. Location of the initialization data for the card and the controller. The file location has a default, but a browser button can be used to locate the file. A numerical entry (with incremental up/down buttons) for modifying the offset. I added this feature, to be able to adjust the applied offset (from the init file) when (re)starting the software, without having to modify the initialization data file. This allows to adjust for imprecise positioning at the reference position. Indication of the eight preset frequencies red from the presets data file. The file location has a default, but a browser button can be used to locate the file. A plot of the calibration data. The file location has a default, but a browser button can be used to locate the file. Two push-buttons, for resetting the card's internal "current position" either to zero or to max position (the motor's ½-steps per rev, times the number of revs of the capacitor). This feature is used when the motor is positioned at the known reference position ("end stop"). The LED next to the button indicates whether it is OK to push the button (OK = when the motor is not moving). A block for future functionality. IMPORTANT: I have made the entire design and software package of my controller application available below. It comes without guarantees. Please note that I do not have the time to provide support for its installation or operation. Sorry! The graphical design (detailed block diagram) of V21 of my controller is here (the image has enough resolution for fully zooming-in on the details). The actual LabView "virtual instrument" design file (.vi) of my controller is here. LabView "Pro" supports creating a LabView-independent .exe file. The zipped executable package of my controller is here. This .exe application can run without the LabView development environment (i.e., you don't need the costly LabView suite), but is does require the LabView Run-Time Engine (RTE) Version 8.0. This is available for free - for all standard operating systems - from the National Instruments website. It appears that using RTE version higher than 8.0 causes problems with my software. Of course you must install the drivers that came with the Phidgets card (or download from phidgets.com). I used this executable drivers package. The zipped package of the three data files that I use (initialization, presets, calibration data) is here. Changes to these files must be made with an ASCII-editor such as Notepad or Wordpad - do not use a word-processor such as Microsoft Word! 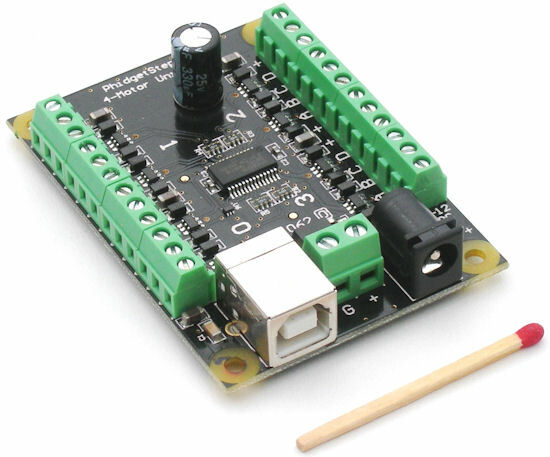 As noted further above, my control software can also be used with the Phidgets 1063 controller for a single bipolar stepper motor. The 1063 is based on 1/16 steps, whereas the 1062 is based on 1/2 steps. When using my software with a 1063 card, the MagLoop-card-init.lvm file must be edited accordingly (again, only with a simple ASCII text editor, not MS Word or similar). This means that I do not know if my software can work at all with Phidgets cards other than 1062 and 1063! You can try it at your own risk. Sorry: I can not provide support for your experiments. In 2016, Patrick Nobecourt (F5TJZ) adapted my design in LabView2015, to make it work with a Phidgets 1067 card for his NEMA17 motor. He included current monitoring/protection and increased the velocity limit. Patrick actually uses two cards and two motors in the remote matching unit for his vertical antenna: one for a vacuum variable capacitor, the other for a variable inductor. His .vi design file is here, the two executable are here, and the associated initialization data files are here. Before I get into all the details of the DC motor-drive that I developed for my vacuum capacitor, here is a simple-yet-effective way to motorize such a capacitor - if the shaft of the capacitor moves in & out of the capacitor as the shaft is turned. Unfortunately, this is not the case with my capacitor. If the shaft does move out when the shaft is unscrewed, then an inexpensive small DC-motor with down-gearing can be used. If mounted on a thin, flexible L-bracket, the motor (and the bracket) will be pushed away from the capacitor when the shaft unscrews. This can be used to actuate a micro-switch when the shaft is approaching its maximum position. With some simple circuitry, the motor will then only be allowed to reverse direction. The geared-down motor can produce a certain maximum torque. It should be small enough, such that it cannot damage the capacitor when the shaft is completely screwed in. The motor will simply stall at that point. 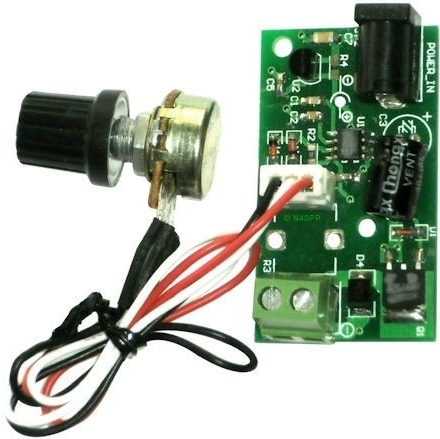 This is easily detected with a simple motor-current monitor, consisting of an LED across a current-sensing resistor in series with the supply voltage. Ref. 11A. This concept can actually be expanded to a provide end-stop protection for a capacitor shaft that does not move in & out. The rotational movement of the motor-capacitor shaft has to be converted to linear motion. This can be done with a threaded rod (lead screw, feed screw) and a screw nut that is installed on the rod. It has to be prevented from turning with the shaft, and only be allowed to slide along the rod. The nut can then actuate a micro switch (or two such switches, to obtain end-stop protection at both ends of the motion range). An implementation of this by Dominique, F1FRV, is illustrated below (ref. 12F). The design includes a remote control unit and a 10-turn potentiometer (down-geared) for position feedback. The shaft of my vacuum capacitor makes 36 turns, end-to-end. I would like the motor to turn the required 36 revs in about 1 minute. I.e., a speed of about 36 rpm. I selected a motor with a gearbox that has 2 output shafts. This way, I can add a multi-turn potentiometer for position feedback in the shack. If you do not want this feedback, you can use a motor with a single output shaft. However, I recommend that you do add the feedback, or at least get a 2-shaft motor, so you can easily add the feedback when you finally find out that you really need or want it. I purchased the motor via eBay ("worldwide" search on "DC 12V 35RPM Double Shaft Worm Geared Motor GW31ZY"). It delivers a nominal torque of 147 N.cm (15 kg.cm). This is plenty! The output shafts have a diameter of 8 mm. Connect one motor shaft to the capacitor shaft. 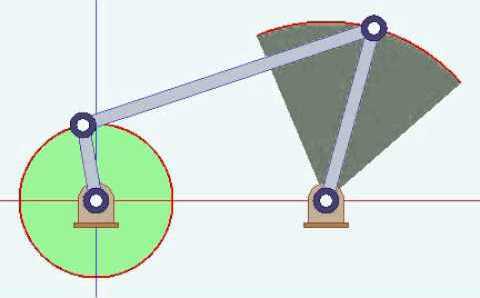 Convert the shaft rotation to linear motion, with actuation of an end-stop switch at both ends of the linear travel. 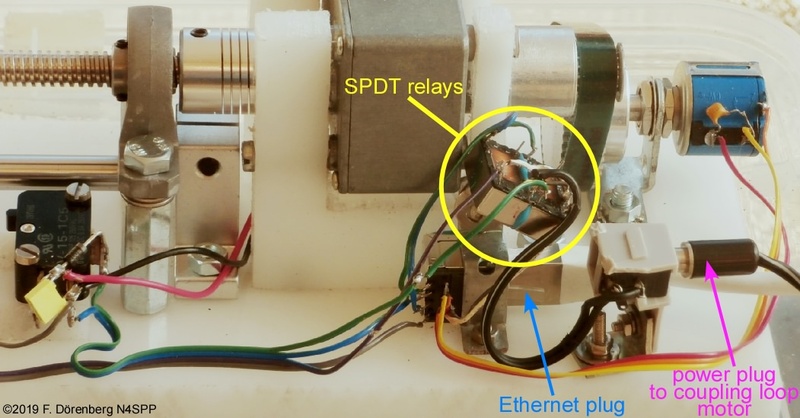 Connect the other motor shaft to a multi-turn potentiometer for position feedback. I selected a lead screw (feed screw, threaded rod, D: "Spindel, Leitspindel", F: "vis-mère") with a length of 200 mm (20 cm, 8 inch) and a pitch of 2 mm. I.e., the thread makes 200/2 = 100 turns. A nut can spin on the lead screw. For 36 revs, this nut will travel 36 revs x 2 mm/rev = 72 mm = 7.2 cm. The nut must be prevented from turning. It shall only translate along the lead screw. To do this, I used an 8 mm guide shaft. It is installed parallel to the lead screw. A slider block can move freely on the guide shaft. 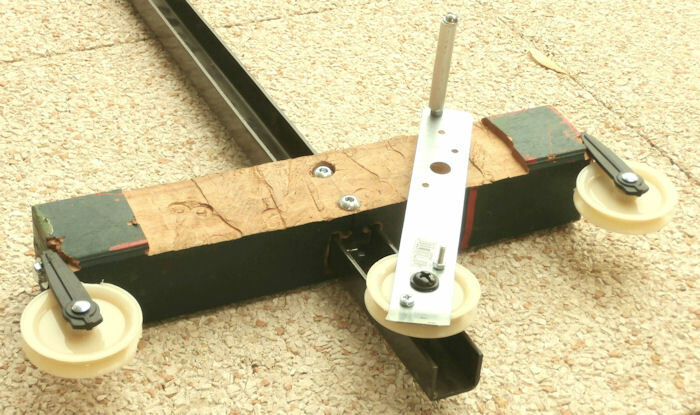 The lead screw nut is fixed in a groove of a piece of poly cutting board that is mounted onto the slider block. I mounted the lead screw just above the guide shaft. The two pillow block bearings of the lead screw are raised with standard M6x30 mm standoffs (I also needed washers between the standoffs and the bearings, to raise the bearings another 3 mm). Sets of a lead screw with one or two guide shafts and mounting material are easily available via eBay (do "worldwide" search for "Lead Rod Linear Shaft Rail Support Slide Block Couplings"). One end of the lead screw is connected to one of the motor shafts. This is done with a flexible shaft coupler (8 mm to 8 mm). The other end of the lead screw must be connected to the capacitor shaft. This must be done via an insulating shaft, to avoid the capacitor voltage from ever reaching the drive system and remote control. I used a 10 cm (4 inch) section of acetal copolymer (polyoxymethylene-C, POM-C). This is acetal resin, a thermoplastic that was discovered in the 1920s by the German scientist Hermann Staudinger. POM trade names incl. delrin® ( = acetal homopolymer = POM-H). This insulating material has high strength and stiffness, good dimensional stability, is abrasion resistant, easy to machine (lathe, mill, drill, laser cut,…), and is generally unaffected by solvents, fuels, other chemicals. 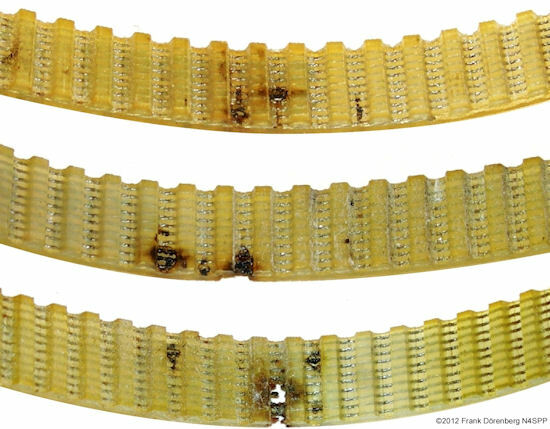 Its mechanical properties are somewhere between metal and plastic. Two flexible shaft couplers are required: 8-to-8 mm between the lead screw and the insulating shaft, and an 8-to-12 mm coupler between the insulating shaft and the capacitor shaft (12 mm diameter). The motor is probably strong enough to destroy the capacitor when continuing to drive when the end of the capacitor's shaft is reached. In the opposite direction, the capacitor shaft becomes unscrewed and can fall out of the capacitor. So, we need end-stop protection at both ends of the 36 rev travel! This is why we convert shaft rotation to linear motion, and use micro-switches to detect reaching the end of the travel. The micro-switches must be "single pole, double throw" (SPDT) types. I.e., with three contacts: common, "normally open" (NO), and "normally closed" (NC). The switches are not only used to interrupt power to the motor, but also to enable changing the motor direction away from the end-stop. The capacitor shaft makes 36 revs, and a standard multi-turn potmeter makes 10 turns. So we need 4:1 down-gearing. I decided to do this with two gears (note: "gear wheel" is a misnomer) and a small timing belt (toothed belt, synchronous belt). 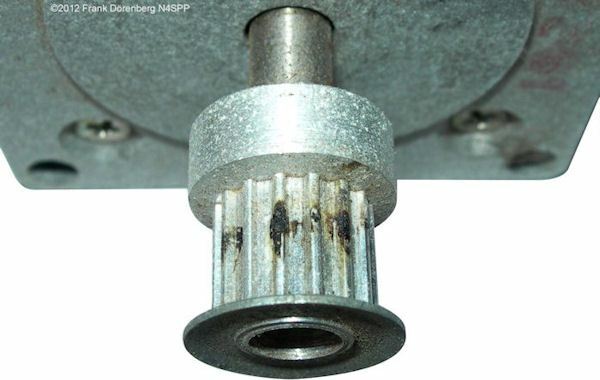 The pulley on the second motor shaft has a width of 10 mm and 15 teeth. This is a flanged pulley, so the belt will stay on. 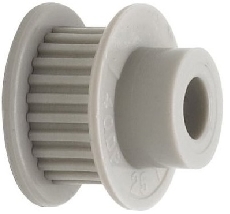 The pulley on the potmeter shaft has a width of 10 mm and 60 teeth. The belt is an 8T2.5x150, i.e., 8 mm wide, with a "tooth" pitch of 2.5 mm, and length of 150 mm ( = 60 teeth). The capacitor and the entire drive system are mounted on a 10x60x1.1 cm plate of acetal copolymer (polyoxymethylene-C, POM-C), bought via eBay. All holes are countersunk on the back side of the plate, and used with countersunk ("undercut") M4, M5, and M6 screws. See the photos below. IMPORTANT: even though flexible shaft coupler are used, alignment of the capacitor shaft, the leads screw rod, and motor shaft must be done very accurately! This means that the various holes in the POM plate must be located accurately: much better than 0.5 mm = 0.02 inch = 20 thou. So, you must use a caliper when marking the drill holes, and use a drill stand to drill straight and at the marked location! IMPORTANT: as stated, the capacitor shaft shall not be driven all the way to its physical limits. To avoid destroying the capacitor, the end-stops are carefully adjusted such that only 35 of the 36 capacitor shaft revs are used, with 1/2 rev margin at each end. I mounted the micro-switches on a small piece of poly kitchen cutting board. It has a slot in it, so its position can be adjusted parallel to the lead screw and guide shaft over a distance of about 1 cm (see Fig. 112 and 116 below). Make sure that the micro-switches are wired correctly: before fixing the flexible shaft coupler to the capacitor shaft, drive the motor so as to center the lead screw nut about half way between the mirco-switches. Then drive in one direction and manually actuate the associated micros-switch. Then repeat in the other direction. As stated before, the lead screw nut will move over 70 mm for 35 revs. So the micro-switches must have a nominal spacing of 70 mm, plus the length of the slider block on the guide shaft. Adjust the position of the second micro-switch, such that it switches after moving exactly 35 revs away from the opposite switch. Then drive until the micro-switch corresponding to the capacitor's hard mechanical limit is actuated (CW rotation for my capacitor). Then manually rotate the capacitor shaft to that stop, and back off 1/2 rev. At this point, the capacitor "bottle" is fixed in place. I used two long cable ties that go through the mounting plate. Note that the plate has a hole for the nub of the capacitor bottle. See the far left side in Figure 113. Now the shaft coupler on the capacitor shaft is fixed. Likewise, the 10-turn potentiometer has physical limits. 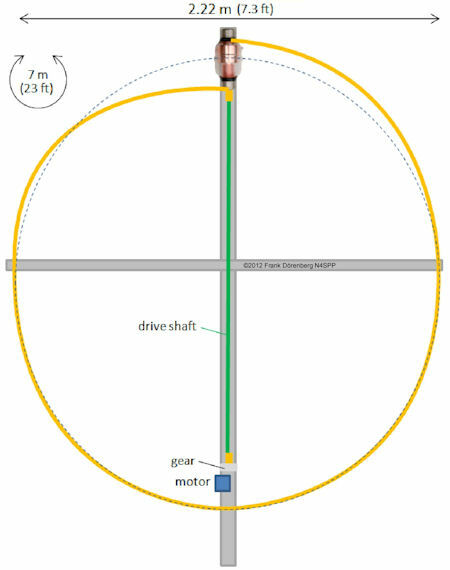 The 4:1 down gearing of the second motor shaft results in 35 / 4 = 8.75 revs of the potmeter shaft. This leaves a margin of (10 - 8.75) / 2 ≈ 0.6 revs on each side of the travel of the potmeter shaft. Once the micro-switches are adjusted, the system is driven until one of the micro-switches is engaged. Make sure (!!!) you know the turn direction of the second motor shaft during this system movement. If you get the direction wrong, you will immediately destroy the potmeter! Turn the potmeter shaft all the way to limit that corresponds to the actuated micro-switch. Then back off 1/2 rev and do not rotate that shaft any more, until the timing belt is installed. The complete drive (capacitor + plate + motor drive) weighs a hefty 4.2 kg (9.3 lbs), about twice the weight of the capacitor by itself. 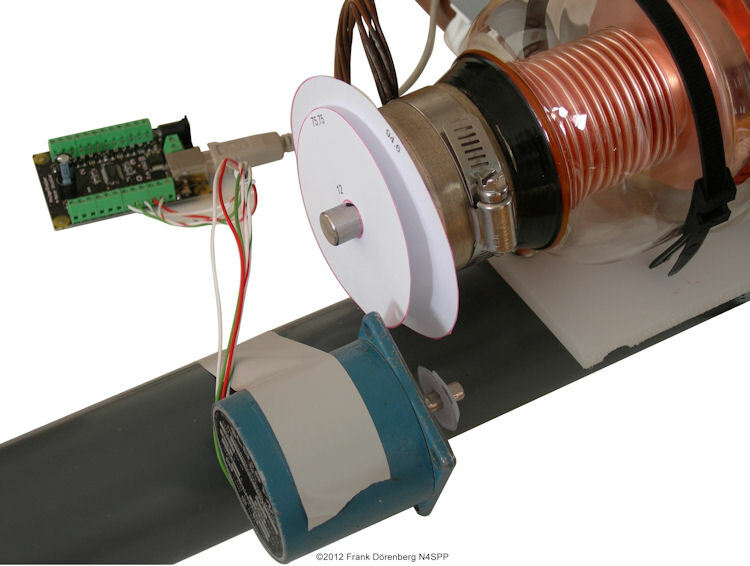 The drive is mounted at the top of the PVC mast (63 mm diam.) with two M6 bolts. Clearly, this configuration makes the antenna quite top-heavy. My antenna is not installed permanently on my terrace. On a windy day, I attach guy wires to the upper half of the mast, in three or four directions. 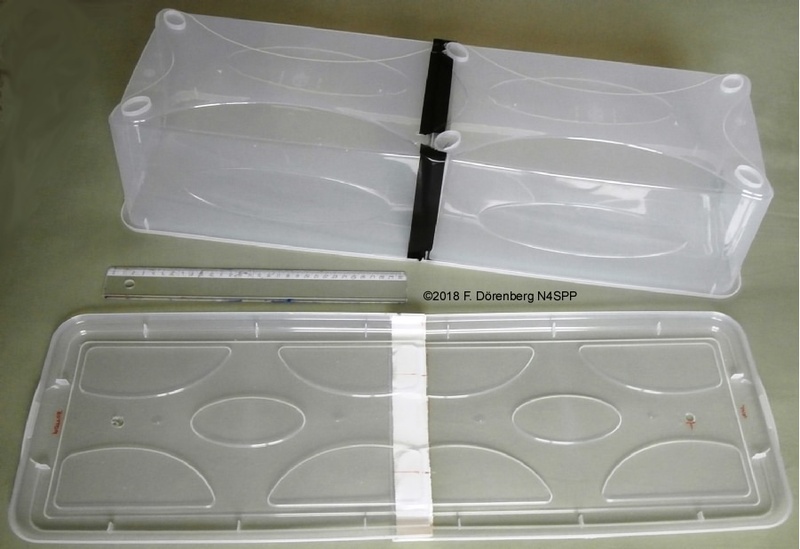 For weatherproofing, I made a hood by combining two inexpensive plastic storage boxes that measure 35x20x15 cm (LxWxH, ≈13.8x8x6 inch). I cut one end of both boxes and of both lids. I combined the two boxes with industrial 1-sided sticky "duckt" tape (sometimes referred to as "duck" tape; I actually used Gorilla® tape), both on the outside and on the inside of the seam, and combined the two lids with industrial 2-sided sticky tape. The merged lids are installed between the plate of the motor drive and the PVC mast. I drilled two 20 mm holes in the hood at the appropriate place for the ends of the 12 mm diameter copper tubing of the main loop. With a thin blade saw, I then very carefully cut a slit between each hole and the open side of the hood. This makes it easy to install and remove the hood. An other hole was made for the cable between the motor drive and the remote control box. I closed the ventilation holes at the top, but left the ones at the bottom open. Selection of motor rotation direction: clockwise (CW), off, counterclockwise (CCW). This will correspond to "increase frequency" and "reduce frequency" (or vise versa). Indication of the drive shaft position (some representation of 0-36 revs). Indication of "end-stop reached", separately for the CW and the CCW direction. Motor stall current warning (not mandatory, but nice to have and easy to implement). 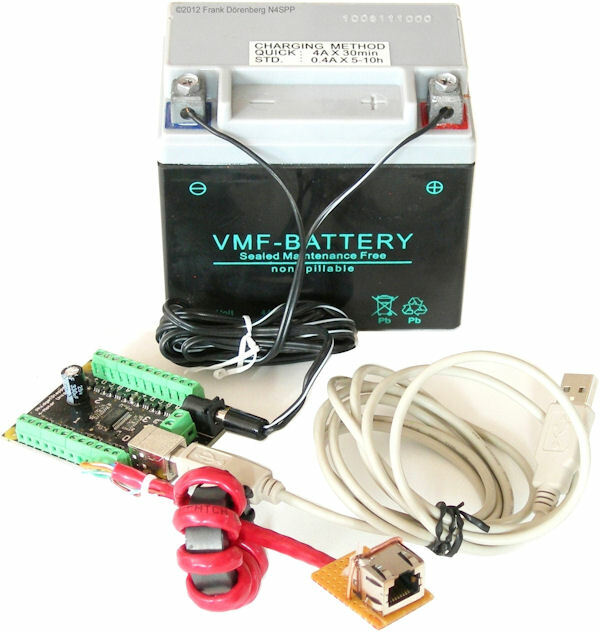 Standard 12-13.8 VDC input (13.8 is the normal supply voltage for transceivers and for charging 12 volt batteries). Multi-wire cable to the motor drive: 2 wires to the motor, 2 wires for the "NO" contact of the CW and CCW end-stop switches, 3 wires for the position feedback potentiometer. So, at least 7 wires. I decided to use a standard Ethernet cable (8 wires). I originally intended to install one or more ferrite rings on these cable, as common mode chokes. However, with 100 watt transmit power, I did not notice any interference in any equipment in the house. So I did not install such rings. Not good! As you can see in Fig. 126 and 128 below, the 12 VDC powerplug on my remote control box is a little too long. The common/ground barrel is exposed. It became "RF hot", which is a rather unpleasant experience! I have added a ferrite choke on the power cord between the control box and the power supply (near the power supply). I placed another one on the control cable to the motor drive (at the control box end). This took care of my problem. I did not give the placement of the the ferrites much thought. Note, however, that a ferrite choke is most effective at the point along the cable where the common mode current wave is at its maximum, per the standing wave pattern. Depending on the length of the cable, there may be severeal such points - and they move with the operating frequency (frequency band). Fig. 124 below shows the simple schematic for a remote control box. It includes high/low speed selection, by switching in a series-resistance of a couple of ohms. The shaft position feedback indication is done with the 10-turn potmeter. I use a separately regulated; supply voltage of 9 VDC for the potmeter, to make the feedback voltage independent of voltage drops in the motor drive circuitry (e.g., across the current-sensing resistor of the motor stall detection). 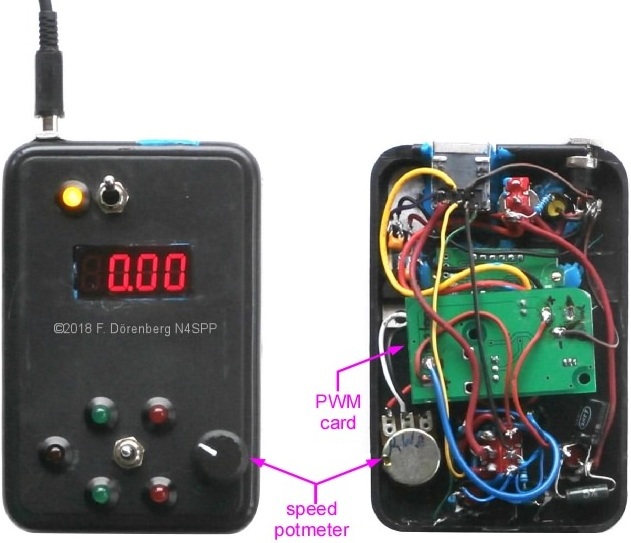 The voltage of the potmeter wiper is measured with a simple and cheap 4-digit digital voltmeter (via eBay; search for "0.36" 4-Digit Digital Voltmeter Range 0-33V"). The PWM circuit must be placed before the "direction" toggle switch. This means that the brightness of the green motor direction LEDs and the red end-stop LEDs now depends on the duty cycle of the PWM ( = speed setting)... To me, that is a small price to pay for being able to smoothly (and continuously) vary the motor speed between zero and max - with full torque! It just works beautifully! The size of the coupling loop is fixed. Standard recipe is 1/5 the size of the main loop, but I normally use a slightly larger coupling loop. The position of the coupling loop is fixed, after adjusting it once for lowest SWR on the frequency (or frequency range) of interest. Sometimes the shape of the coupling loop is also adjusted. In the video clip above, it looks like the linkage only has 3 bars. However, it is generically called a 4-bar linkage. The fourth bar is the "vertical" offset between the axis of rotation of the motor and of the load. I.e., if the motor is moved up or down along the gray vertical line in the image. The length of the crank on the motor shaft ( = distance between shaft axis and swivel point at the end of the motor crank). The length of the crank on the load ( = distance between axis of rotation of the load, and swivel point at the end of this crank). The length of the push-pull bar between the two cranks ( = distance between the two swivel points). The distance between the two axes of rotation. The drawing above shows the dimensions that I finally selected. The motor mount, the two "arms" and the push-pull bar are all made of 11 mm thick polyethylene ( = kitchen cutting board). This material is light, strong, and easy to machine (drill, saw, grind,...). I fixed he motor mount to the PVC tube mast with a standard "munson" type tube/pipe clamp and a heavy angle bracket. The swivels are made of 6 mm bolts, with washers and lock nuts ( = nut with a nylon insert). Note that the crank bars on the motor shaft and on the coupling loop have some extra lenght and holes. This was done, just in case I needed to make some adjustments to the swing range. Actually, my original design was very close to "perfect". I completed this motor drive mid-January 2019. Now I have to run some tests, and see if I can increase the frequency range and/or installation height for whcih I can get good SWR (better than 1.3). Just like the motorization of the tuning capacitor can be automated, so can the coupling loop drive. Work on this has been done by the (primarily) Japanese "MLA 48" group, in particular Hajime Nakajima (JR1OAO). 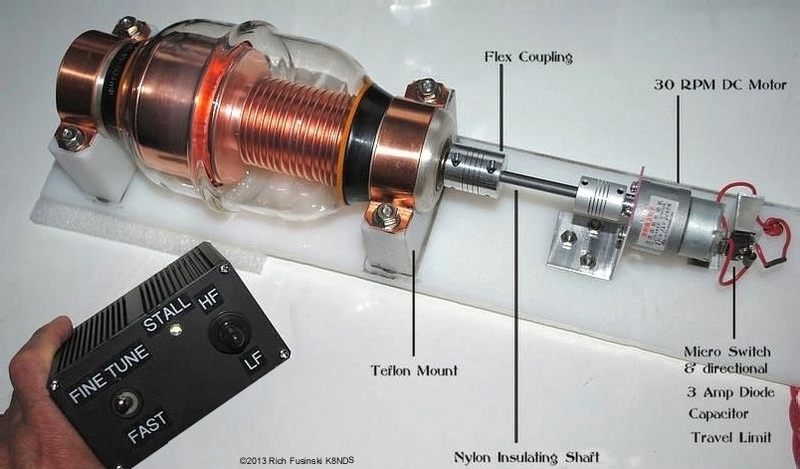 His automatic antenna coupler measures the RF voltage and current at a point along the coax to the antenna. The position of the coupling loop position is adjusted based on the ratio of these two parameters (effectively an impedance value), to minimze the SWR. The measured phase angle between the current and voltage is is used to adjust the motorized tuning capacitor until the resonance frequency matches the operating frequency. Note: the phase angle be adjusted/calibrated is measured at the antenna feedpoint (or a point along the transmission-line that is at an electrical distance of a whole multiple of 1/2 λ away from the feedpoint). Ref. 2E: "DG0KW Magnetic - Loop Antenna - Calculator", Klaus Warsow (DG0KW); note: 3 GUI languages selectable via the "options" tab. Ref. 2G: "Calculate small transmitting loop gain from bandwidth measurement", V. 1.03, on-line calculator for efficiency and and gain of a small single turn transmitting loop in free space from VSWR bandwidth, matched frequency, loop radius and conductor radius or resonating capacitance, Owen Duffy (VK1OD, VK2OMD), 2014/2015. Ref. 4A: "The Midnight Loop - An Experimental Small Transmitting Loop ~ Theory & Practice ~", G. Heron, N2APB and J. Everhart, N2CX, Massachusetts QRP Convention 2010, 52 slides. Ref. 6D: "Neue Speisetechnik für Magnetic Loops" [new feeding method for magnetic Loops], Lásló Rusvai (DL2JTE/HA7HN), in "CQ-DL", 6-2007, pp. 421. Ref. 7: "FAIR-RITE Material Data Sheets for Materials Nr. 31 -98", Fair-Rite Products Corp; Core Loss vs. AC Flux Density - Type 61 Material; Initial Permeability and Loss Factor vs Frequency of Type 43 material". Ref. 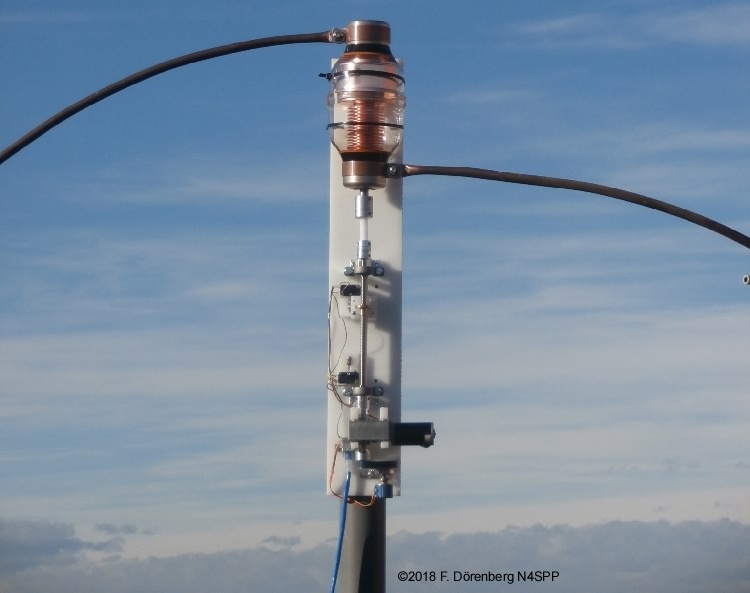 8H: "Small Gap-Resonated HF Loop Antennas", Kai Siwiak (KE4PT), Richard Quick (W4RX), in "QST", September 2018, pp. 30-33. [pdf] See note at bottom of this page. Ref. 10: "Tube roller" by Roger Dunn (VK4ZL), September 2011, 2 pp. ; used with permission. Ref. 11B: "Easy Step'n - An Introduction to Stepper Motors for the Experimenter", David Benson, Square 1 Electronics, 200 pp. Ref. 12A: "Variabele condensator in olie" [in Dutch], Otto Kühn (PA9OK, SK), in "Electron" (VERON), December 2010, pp. 527-529. See note at bottom of this page. Ref. 12D: Equation 13.5 in "Capacitive sensors", Section 13.2 in "Handbook of modern sensors: physics, designs, and applications", Jacob Fraden, Springer-Verlag New York, 2010, 663 pp. Ref. 12H: p. 73 in "Capacitive sensors: design and applications", L. K. Baxter, IEEE Press, 1997, 320 pp. Ref. 13A: "A New Tune for the Loop", John Seager (G0UCO), in "QEX", September/October 2010, pp. 35-37. Accessed 9 April 2019. [pdf] See note at bottom of this page.